View the featured chart from the 5-7 charts we typically publish in each issue. Click to enlarge. 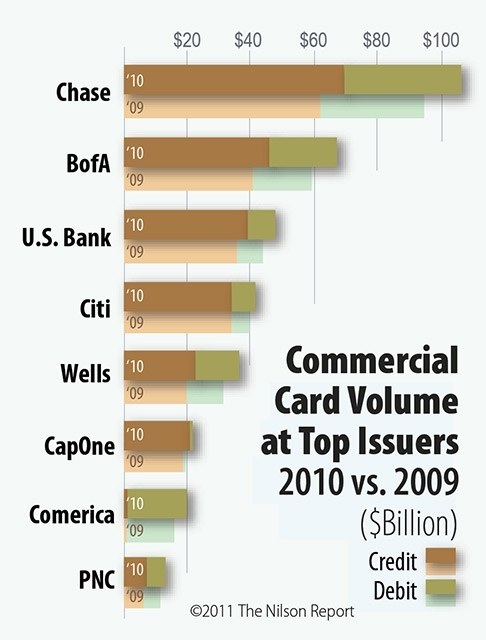 The 50 largest issuers of debit and prepaid cards in the U.S are shown on the table on pages 10 and 11. 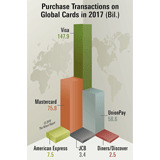 Cards from those issuers generated $1.989 trillion in purchase volume for goods and services in 2018. The 10 largest are shown here. 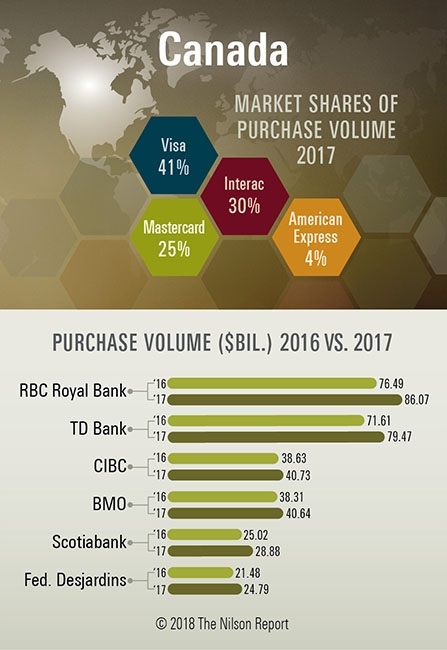 Market shares for Visa, Mastercard, Interac, and Amex brands, as well as issuers TD Bank, BMO, RBC, CIBC, Scotiabank, and Desjardins are shown for purchase volume in 2018. Top Acquirers in the U.S.
Owners of the 66 largest portfolios of merchant card acceptance contracts in the U.S. are ranked on pages 10 and 11. 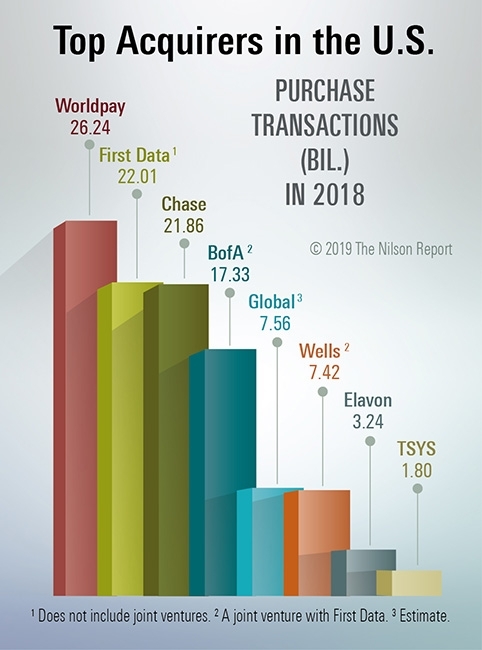 The 8 largest based on purchase transactions processed in 2018 are shown here. 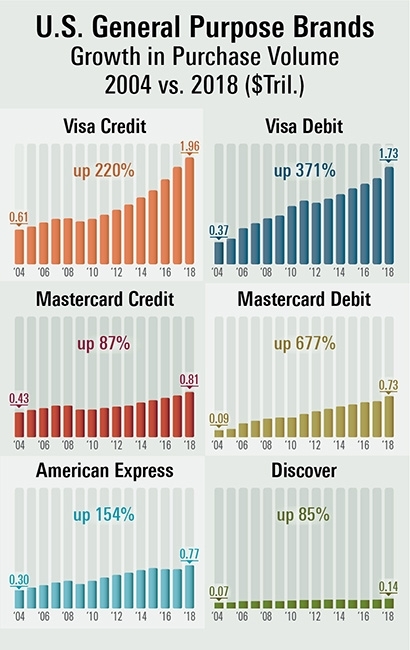 Top Issuers of General Purpose Credit Cards in the U.S.
Purchase volume—spending for goods and services—tied to Visa, Mastercard, American Express, and Discover cards issued in the U.S. reached $3.678 trillion in 2018, up 9.7% over 2017. 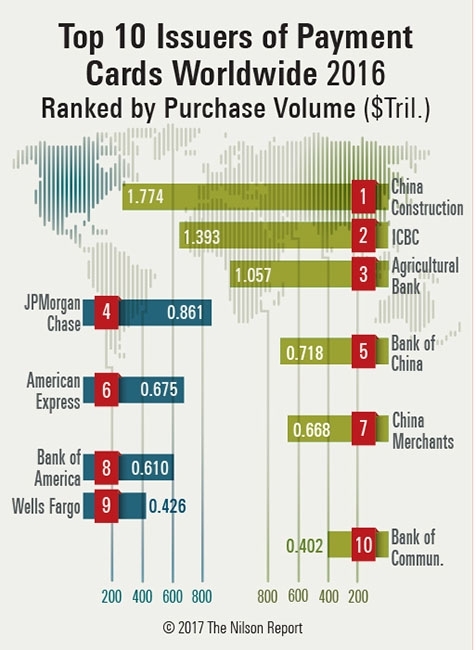 The eight largest issuers ranked by credit card purchase volume are shown here. 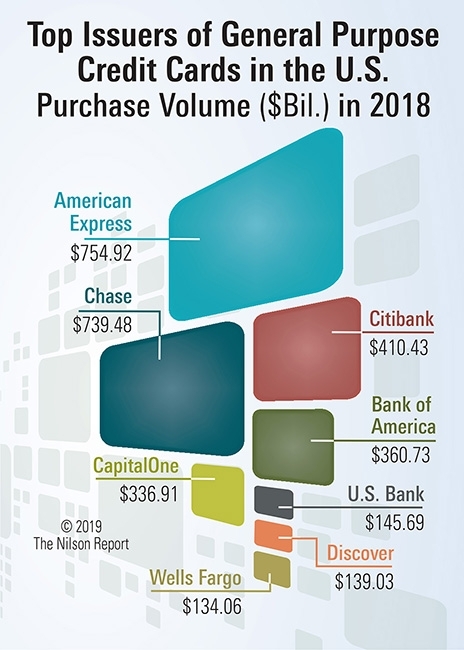 Visa, Mastercard, American Express, and Discover cards in the U.S. generated $6.130 trillion in purchase volume in 2018, up 10.5% over 2017. 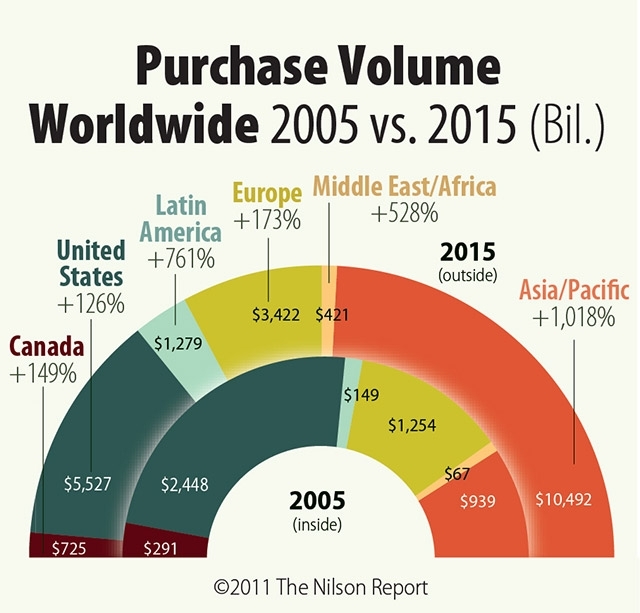 Growth in purchase volume is shown here. 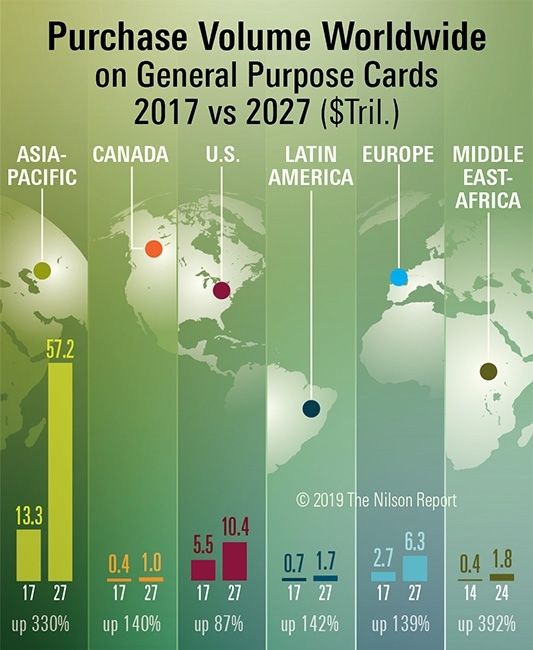 American Express, Discover/Diners Club, JCB, Mastercard, UnionPay, and Visa, which are the global general purpose brands, are projected to generate $78.453 trillion in 10 years. This includes credit, debit, and prepaid cards. Over the last 25 years, purchases of goods and services have grown far faster than outstanding credit card receivables. Contributing to purchase volume growth is the incentive issuers provide consumers in the form of rewards—air miles, cash back, etc. U.S. personal consumption expenditures reached $13.321 trillion in 2017. Purchases of goods and services accounted for 77.64% or $10.343 trillion of that amount. 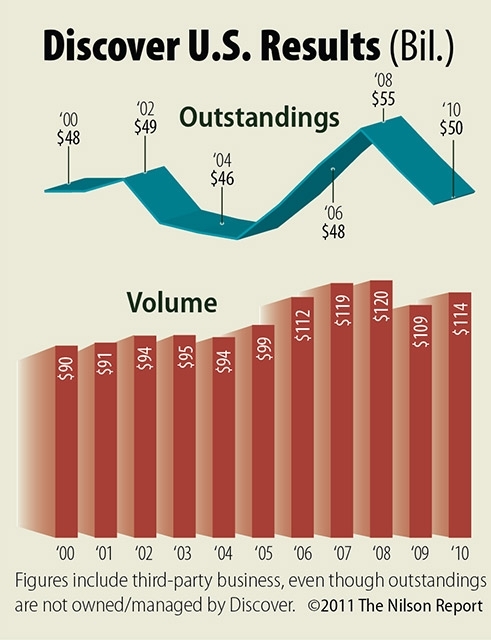 Issuers from the U.S. held a 40% market share among the top 150 portfolios worldwide. 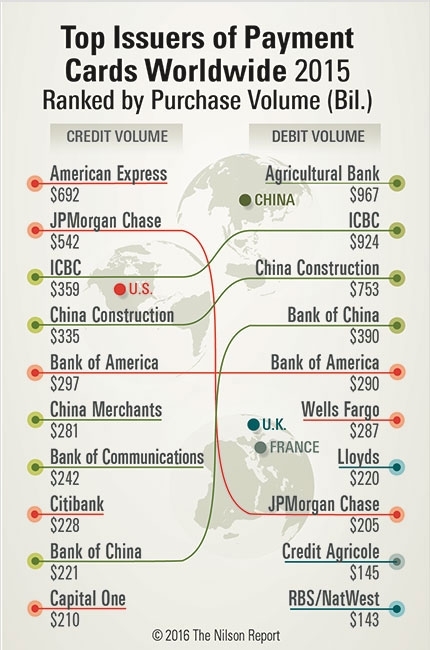 The rankings are based on outstanding receivables tied to Amex, Diners Club, Discover, JCB, Mastercard, UnionPay, Visa, and domestic general purpose credit cards. Gross fraud losses to issuers, merchants, and merchant acquirers reached $24.26 billion in 2017, up 6.4%. 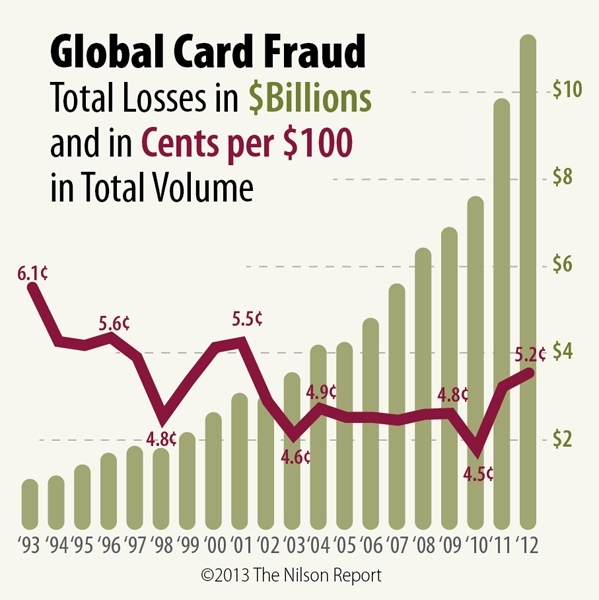 Fraud is measured against total volume generated by payment cards which reached $34.119 trillion worldwide. 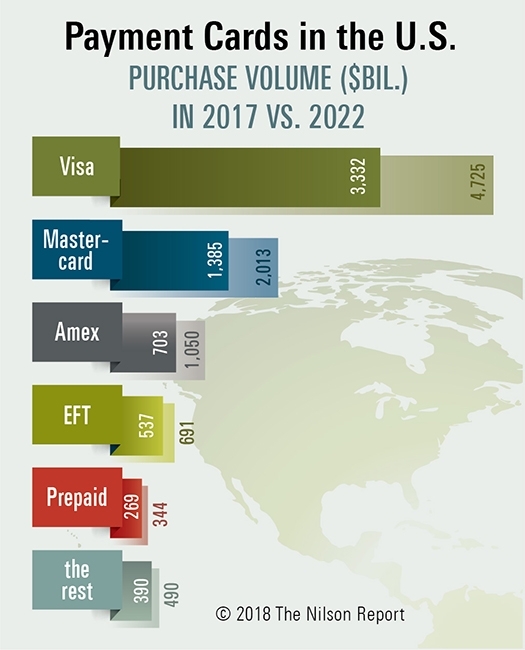 Credit, debit, and prepaid cards issued in the U.S. generated $6.616 trillion in pur-chase volume in 2017. That figure will rise to $9.313 trillion by 2022. 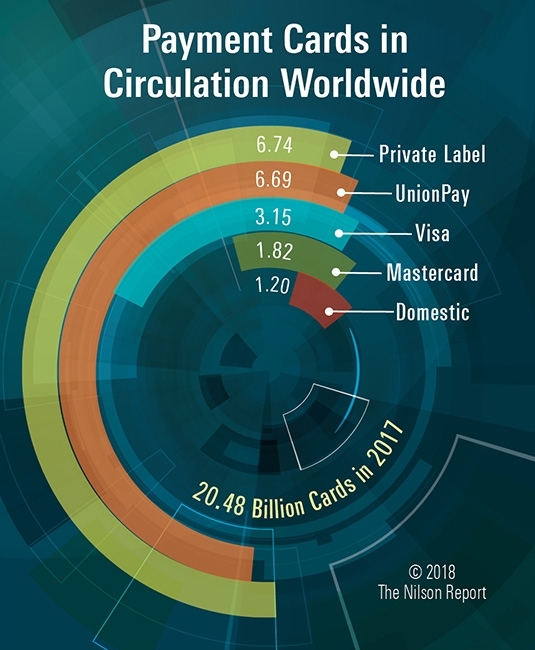 As of December 31, 2017, there were 20.48 billion credit, debit, and prepaid cards in circulation worldwide, including global general purpose, domestic-only general purpose, and private label. 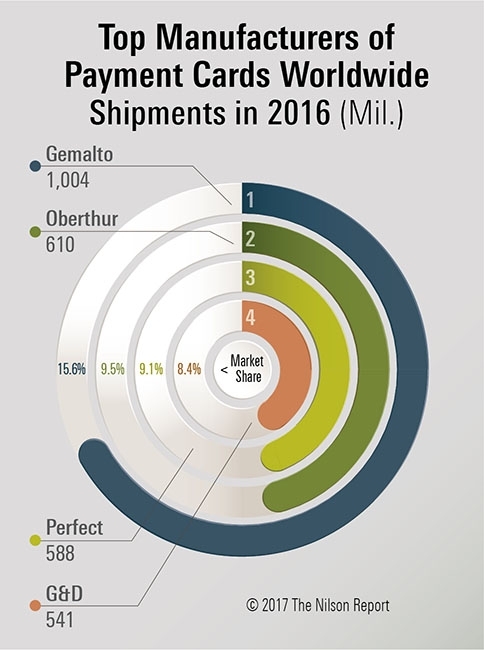 Manufacturers of payment cards shipped 6.49 billion payment cards in 2017, up 0.9% over 2016. 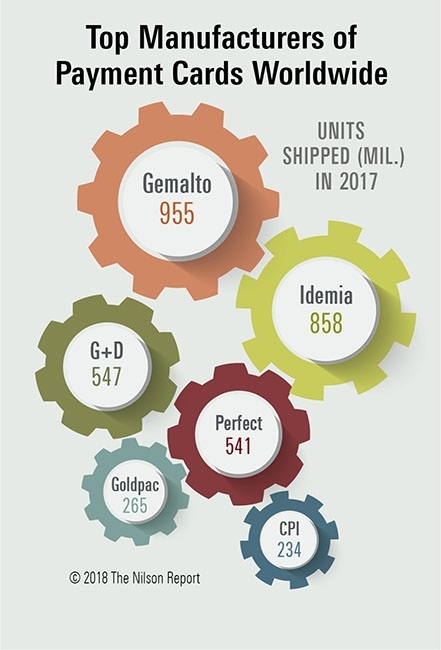 The top suppliers—Gemalto, Idemia, G+D Mobile Security, Perfect Plastic, Goldpac, and CPI—are shown here. 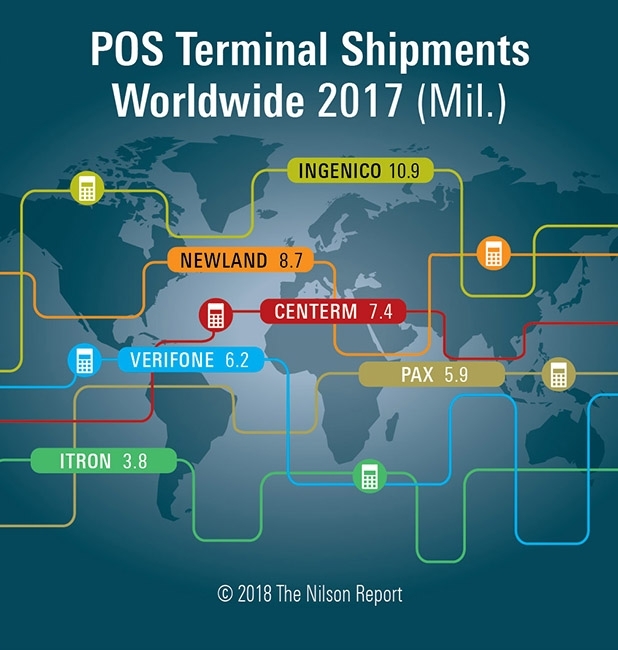 Manufacturers of point-of-sale terminals shipped 68.8 million devices worldwide last year, up 25.2% from 2016. 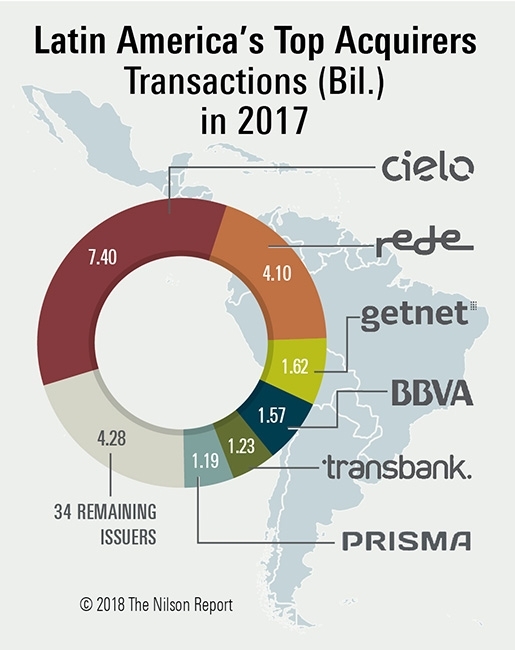 The largest acquirers of payment card transactions from merchants in Latin America and Caribbean are ranked by the number of transactions they handled in calendar year 2017. Collectively, they handled $707.06 billion in purchase volume. 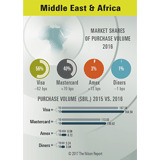 Purchases of goods and services generated by Visa, Mastercard, American Express, and Diners Club credit, debit, and prepaid cards issued in the Middle East and Africa reached $373.63 billion in 2017, up 12.2% from 2016. 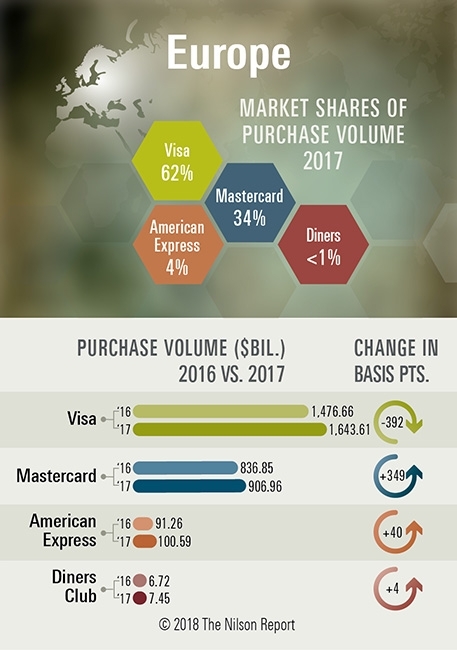 Visa, Mastercard, American Express, and Diners Club credit, debit, and prepaid general purpose cards generated $2.659 trillion in purchase volume for goods and services in 2017 from cards issued in Europe. The largest commercial card issuers in the U.S. are ranked on pages 9, 10, and 11 based on purchase volume in 2017. Rankings include small business credit and debit, fleet, purchasing, prepaid, and corporate products. 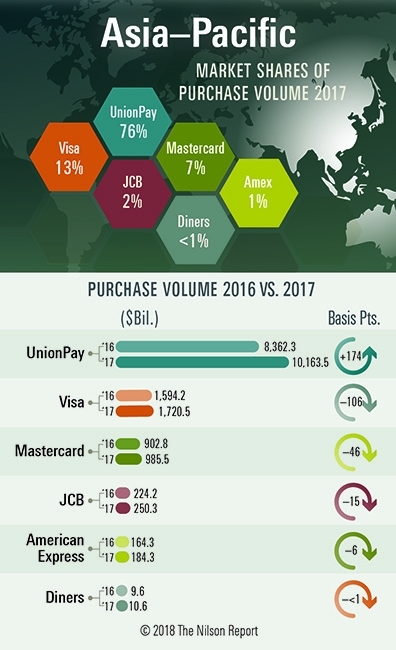 Credit, debit, and prepaid card spending by cards issued in Asia-Pacific carrying the UnionPay, Visa, Mastercard, JCB, American Express, and Diners Club brands reached $13.315 trillion in 2017, up 18.3%. The 45 largest acquirers of card transactions from merchants in Europe processed 67.54 billion payments in 2017. Those transactions, which originated at 10.3 million active merchants, were valued at $2.814 trillion. 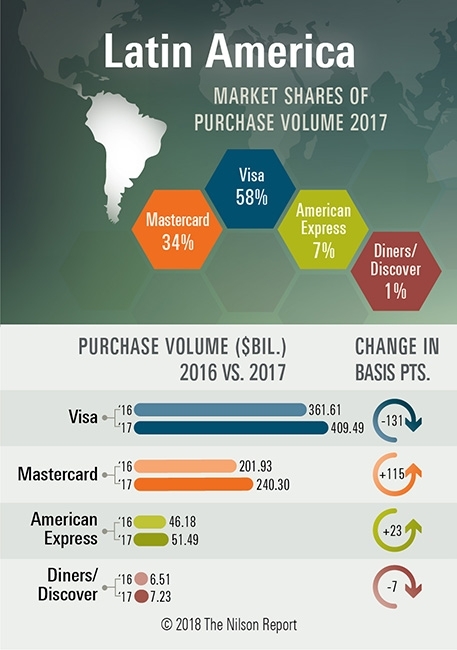 Purchase volume for goods and services in Latin America generated by Visa, Mastercard, Diners Club/Discover, and American Express credit, debit, and prepaid cards reached $708.51 billion in 2017, up 15% versus the prior year. 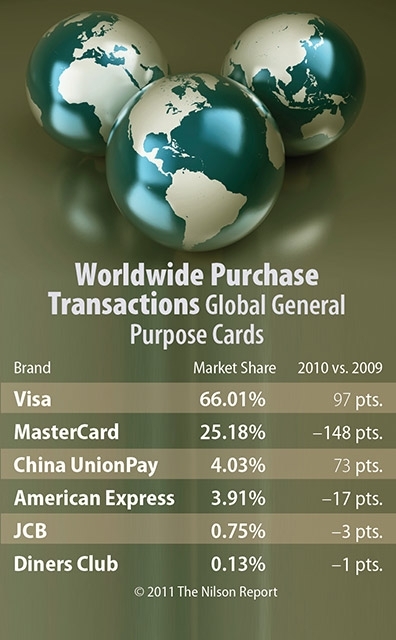 The global brand general purpose cards—Visa, UnionPay, Mastercard, JCB, Diners Club/Discover, and American Express—generated 295.65 billion purchase transactions for goods and services in 2017, up 18.0%. 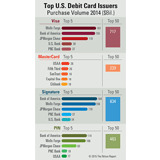 The table on pages 10 and 11 include figures for the 50 largest U.S. debit card issuers. Cards from those issuers combined to generate $1.813 trillion in purchase volume for goods and services in 2017, up 6.1% over the prior year. 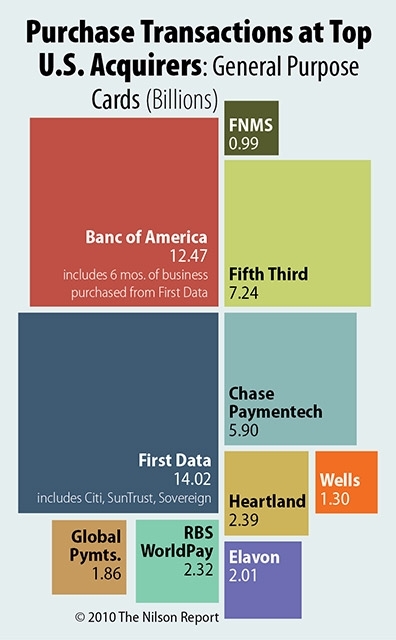 The 10 largest issuers are shown here. 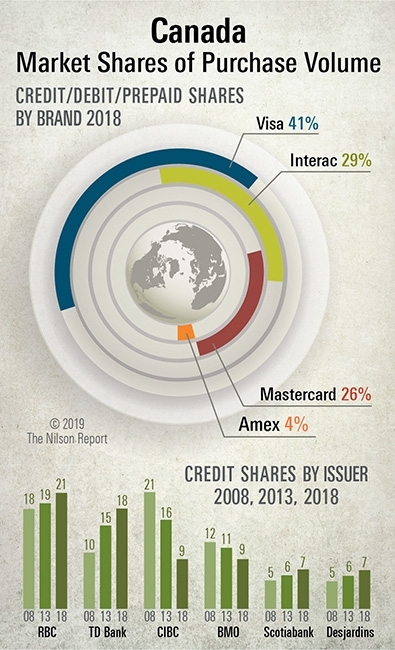 The 23 largest credit card issuers in Canada are ranked on pages 10 and 11. 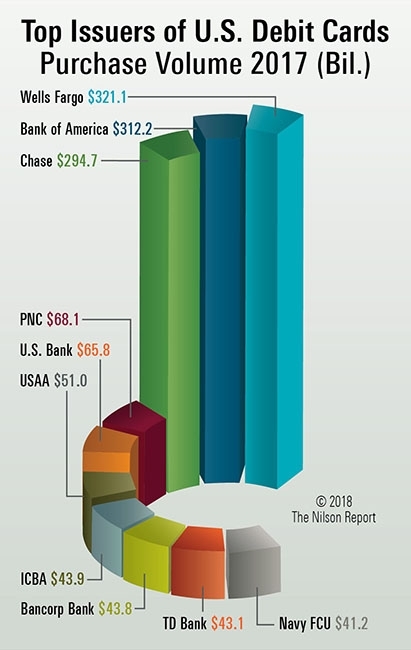 The chart shown here shows the 6 largest issuers in the country based on purchase volume (spending at merchants) in 2017. The 65 largest owners of contracts with U.S. merchants to process credit, debit, and prepaid card payments are listed on the table on pages 10 and 11. The top 8 are shown here. 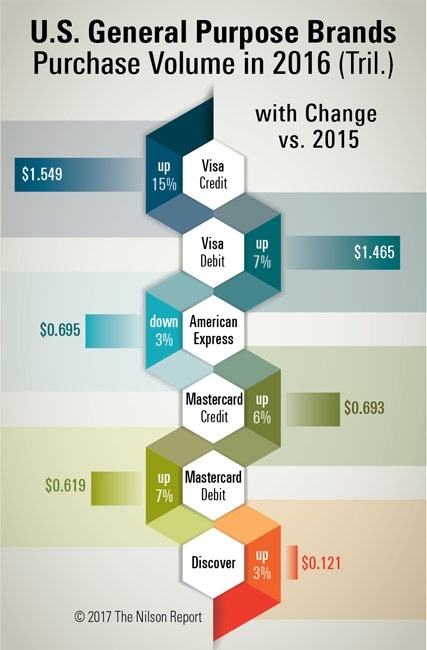 Issuers of Visa, Mastercard, American Express, and Discover credit cards in the U.S. saw purchase volume—spending for goods and services—increased 9.6% in 2017 to $3.352 trillion. 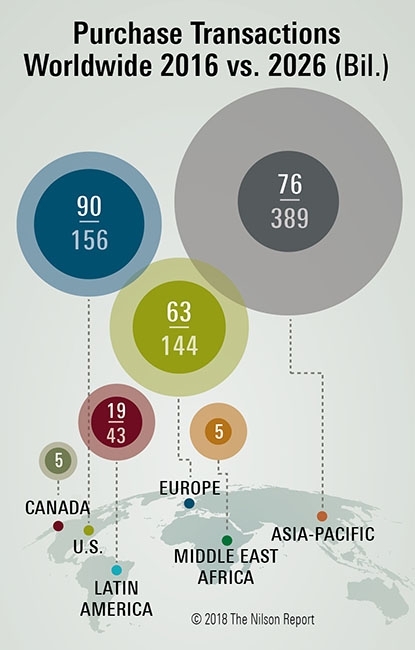 Market shares for the eight largest issuers are shown here. 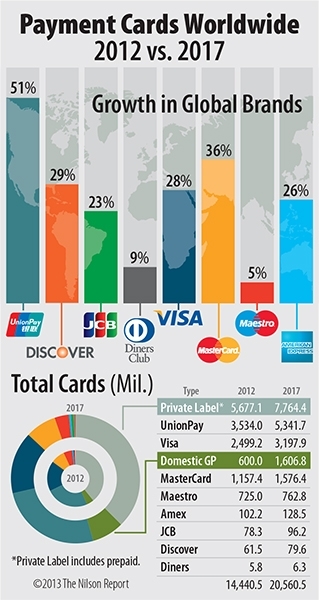 Combined credit and debit card purchases for goods and services tied to cards issued in the U.S. by Visa, Mastercard, American Express, and Discover was $5.550 trillion in 2017. Market shares by brand are provided here. Purchases for goods and services generated by global brand cards which was $20.600 trillion in 2016 is projected to reach $52.390 trillion in 2026. Global brand cards are Visa, Mastercard, UnionPay, American Express, JCB, and Diners Club/Discover. 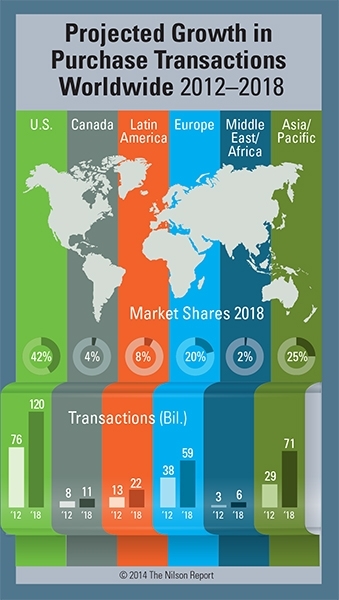 In 2026 global brand credit, debit, and prepaid cards are projected to reach 767 billion purchase transactions for goods and services worldwide. Global brand cards are Visa, Mastercard, UnionPay, American Express, Discover/Diners Club, and JCB. Largest Consumer Payment Systems in the U.S.
U.S. Consumer Payment Systems are comprised of 11 instruments-debit, credit, prepaid, and EBT cards, cash, checks, money orders, official checks, travel checks, preauthorized payments, and remote payments. 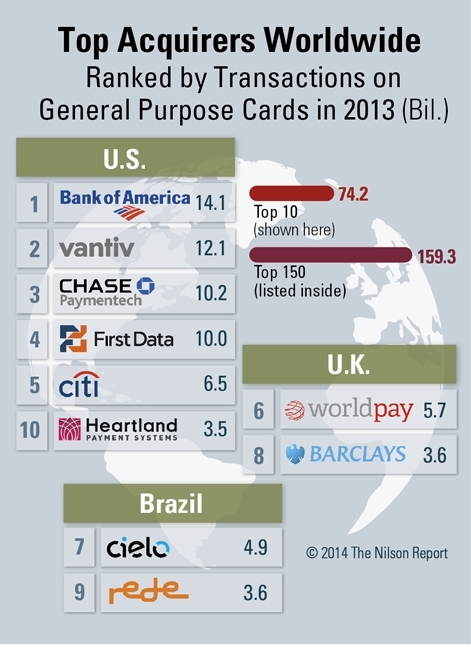 Issue #1121 includes a ranking of the 150 largest payment card issuers worldwide. 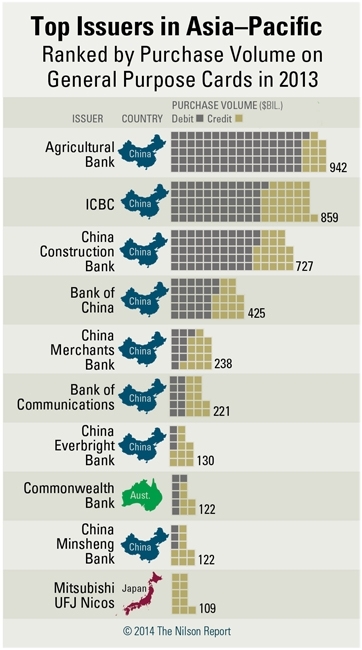 The 10 largest include 6 issuers from China and 4 from the United States. 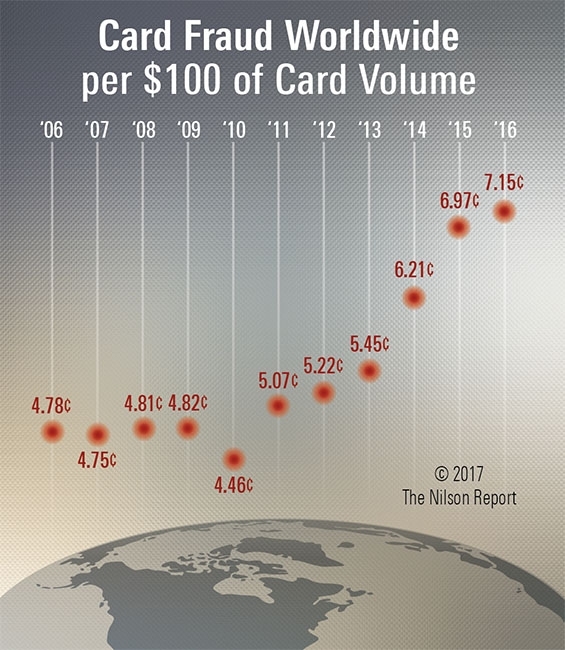 Global card fraud in 2016 reached $22.80 billion. That figure amounted to 7.15¢ per every $100 in combined purchase and cash volume of $31.878 trillion. 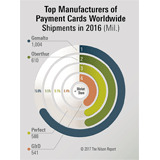 Manufacturers shipped more than 6.4 billion payment cards in 2016. The top suppliers were Gemalto, Oberthur, Perfect Plastic, and Giesecke & Devrient. 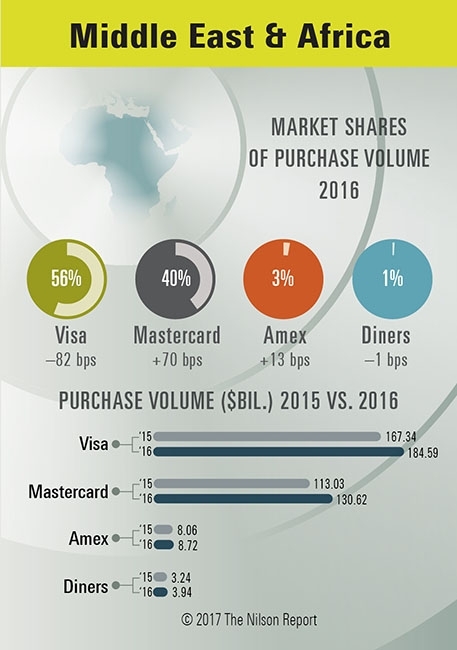 Visa, Mastercard, American Express, and Diners Club cards generated $327.86 billion in purchase volume for goods and services in 2016 from cards issued in the Middle East & Africa. This was up 12.4% from the prior year. 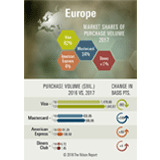 Credit, debit, and prepaid cards issued in Europe generated $2.765 trillion in purchase volume in 2016. 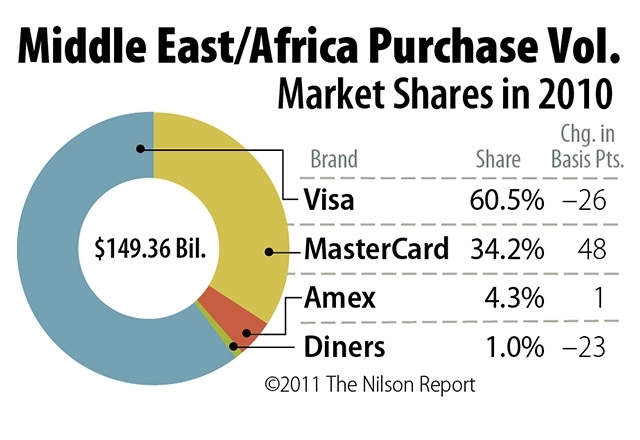 Visa held a 66% market share followed by Mastercard with 31%, Amex with 3%, and Diners Club with less than 1%. 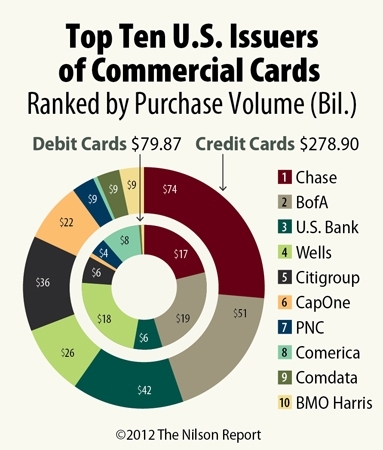 Top Issuers of Commercial Cards in the U.S. 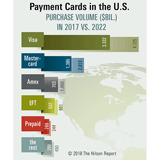 The largest U.S. issuers of commercial card products — purchasing, corporate (T&E), fleet, small business credit and debit, and prepaid — are ranked on pages 7, 8, and 9 based on purchase volume in 2016.
Credit, debit, and prepaid card transactions for goods and services worldwide reached 257.17 billion in 2016 for Visa, UnionPay, Mastercard, JCB, Diners/Discover, and American Express. 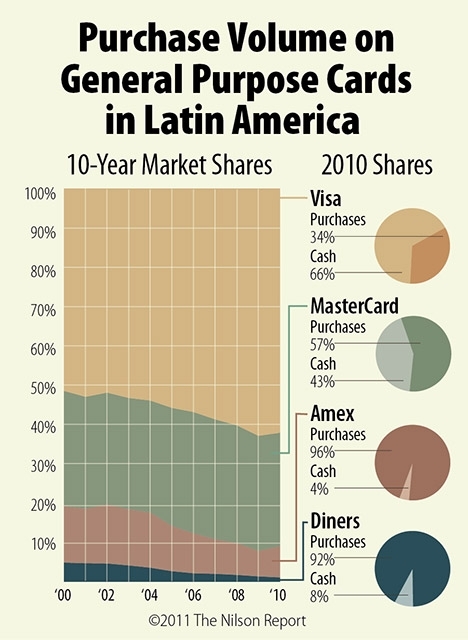 Credit, debit, and prepaid global brand general purpose cards issued in Latin America and the Caribbean generated $599.27 billion in purchase volume at merchants in 2016. Pages 10 and 11 include statistics for the 71 largest acquirers of merchant card transactions in the U.S. in 2016. 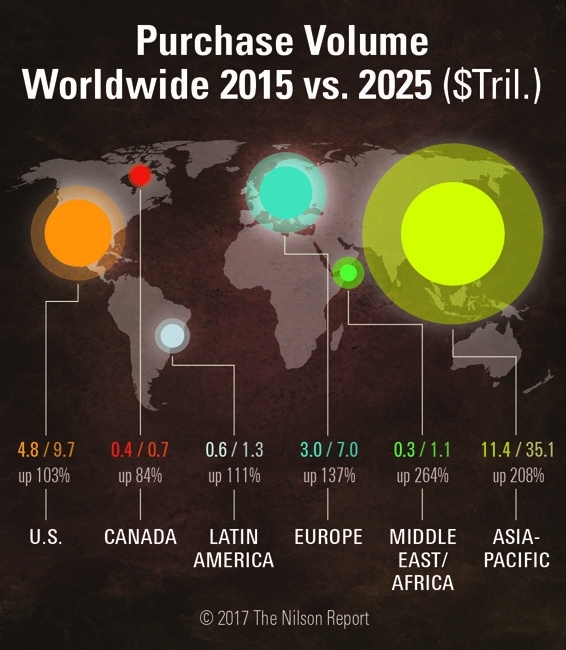 Figures include transactions processed, the value of those payments, and the number of merchant acceptance locations. Purchase volume, which is spending at merchants for goods and services, generated by cards issued in the U.S. totaled $5.143 trillion in 2016. Visa, Mastercard, UnionPay, American Express, JCB, and Discover/Diners Club are the global brand general purpose cards. By 2025, purchase volume for goods and services by cards with these brands is expected to reach $54.891 trillion. Purchases of goods and services accounted for $9.550 trillion in 2015. This accounted for 77.75% of all personal consumption expenditures in the United States. Turn to pages 10 and 11 for a ranking of the 150 largest credit card issuers and 150 largest debit card issuers worldwide. 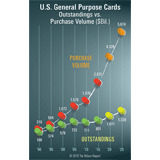 The rankings are based on purchase volume for their global brand and domestic-only general purpose cards. 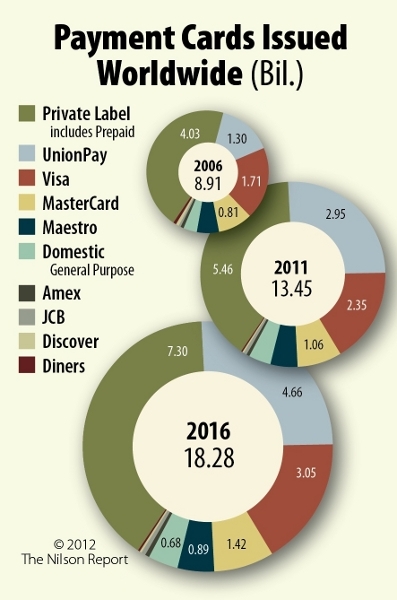 Purchase volume — spending for goods and services — market shares are shown for calendar year 2015 for Visa, Mastercard, Amex, Discover, and other payment card brands. 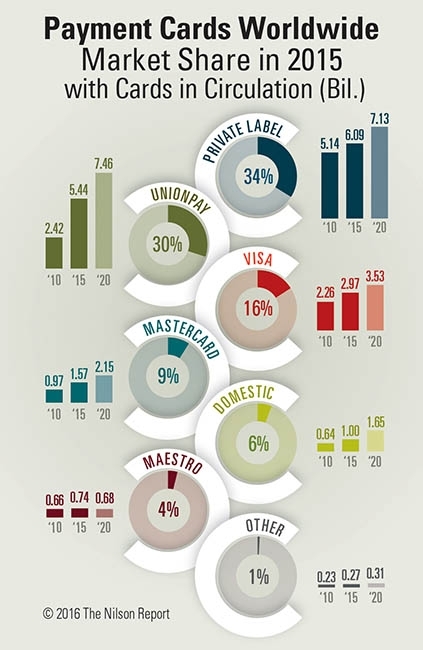 At year-end 2015 there were 18.08 billion payment cards in circulation worldwide — global brand and domestic-only general purpose and private label. That figure will grow to 22.90 billion by the end of 2020. 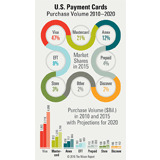 Cards issued in the U.S. generated $4.786 trillion in purchase volume in 2015. 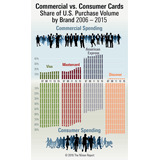 The chart shows spending by commercial vs. consumer products by card brand. 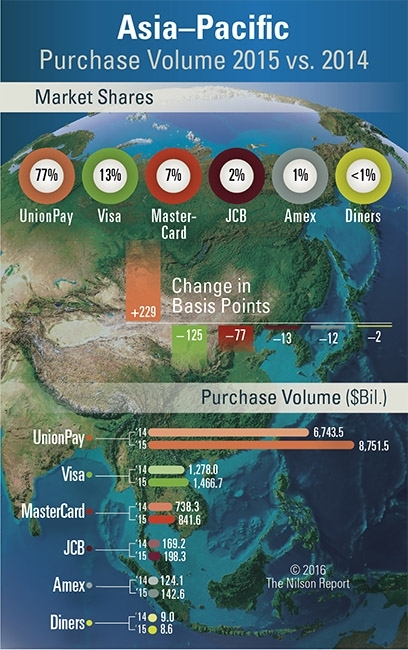 Spending for goods and services tied to payment cards issued in the Asia-Pacific region are identified by network brands - Visa, UnionPay, MasterCard, JCB, American Express, and Diners Club. 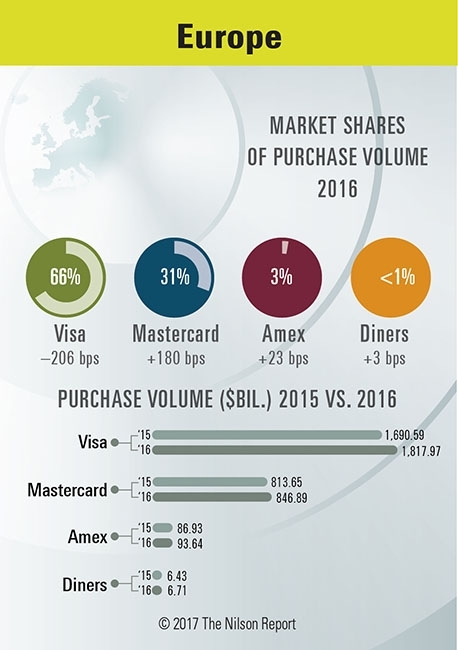 Credit, debit, and prepaid card spending by cards issued in Europe with Visa, MasterCard, Amex, and Diners Club brands generated purchase volume of $2.964 trillion in 2015. 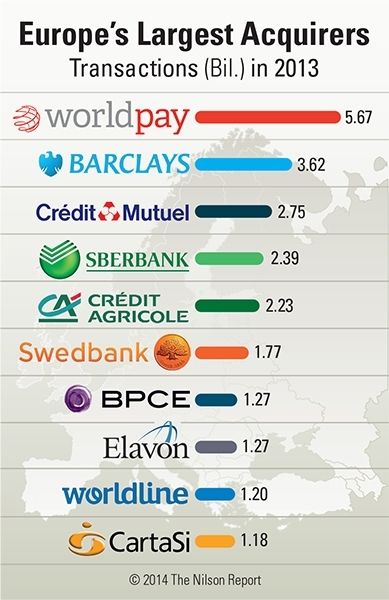 The 40 largest acquirers of card transactions from merchants in Europe are ranked on pages 10 and 11. 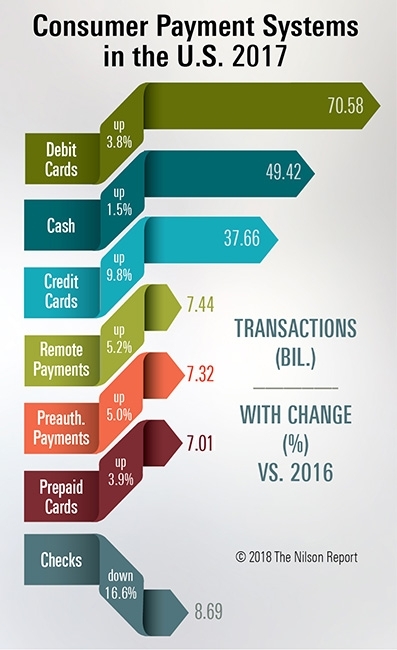 Collectively, they handled 49.66 billion card transactions from 8.7 million merchant outlets in 2015. 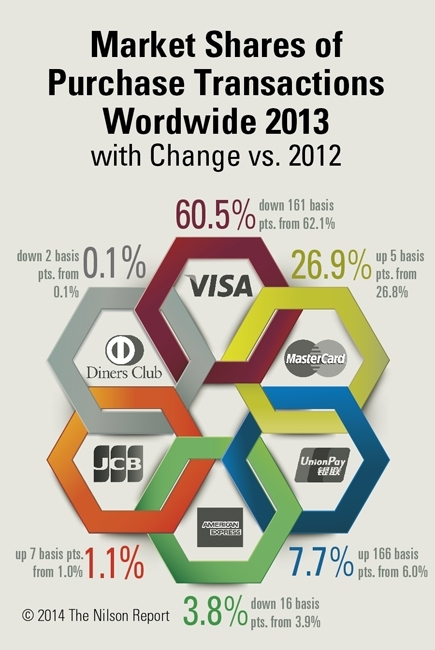 Visa, MasterCard, UnionPay, American Express, JCB, and Diners Club/Discover are the global card brands. 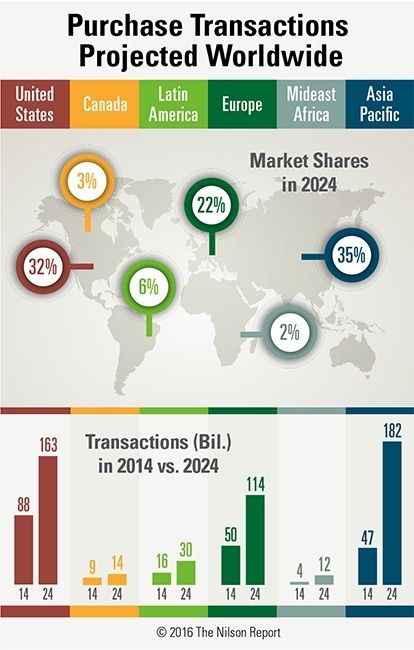 Payments made to merchants worldwide totaled 227.08 billion in 2015. 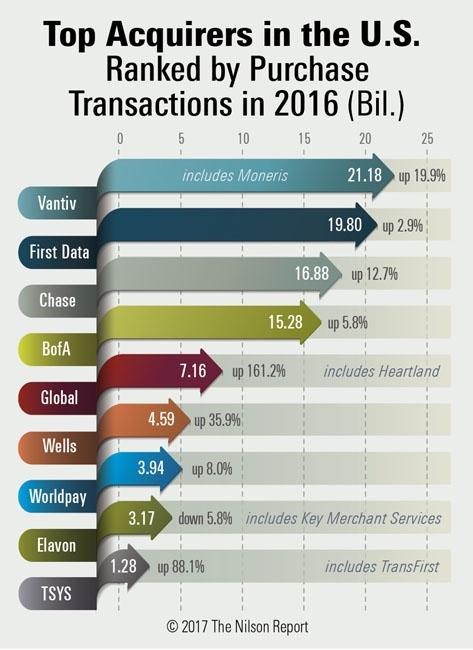 The largest acquirers of payment card transactions from merchants in the U.S. are ranked based on the number they handled in calendar year 2015. 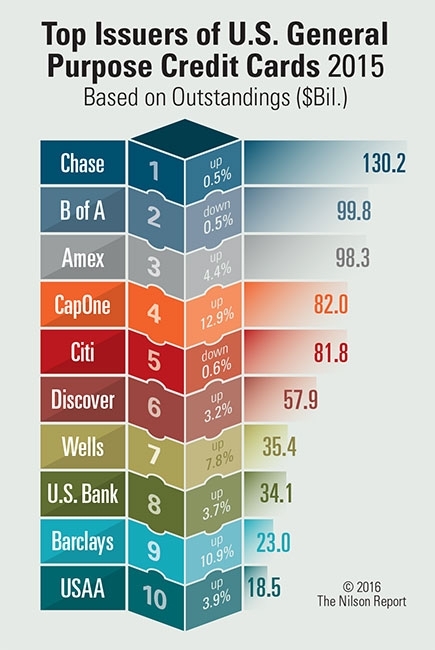 The 10 largest U.S. credit card issuers are ranked by outstanding receivables as of December 31, 2015. 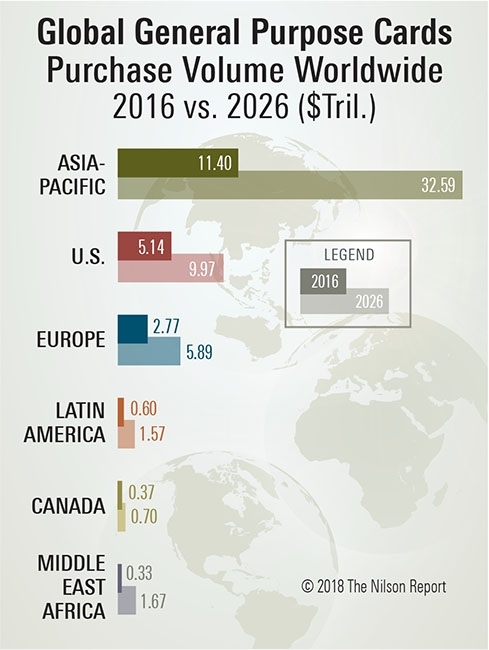 Purchase transactions - those for payments of goods and services - generated by general purpose payment cards are projected to reach 515.42 billion by 2024. Issuers from Asia-Pacific accounted for nearly 1/3 of the 150 largest credit card issuers in the world ranked by outstanding receivables at year-end 2014. 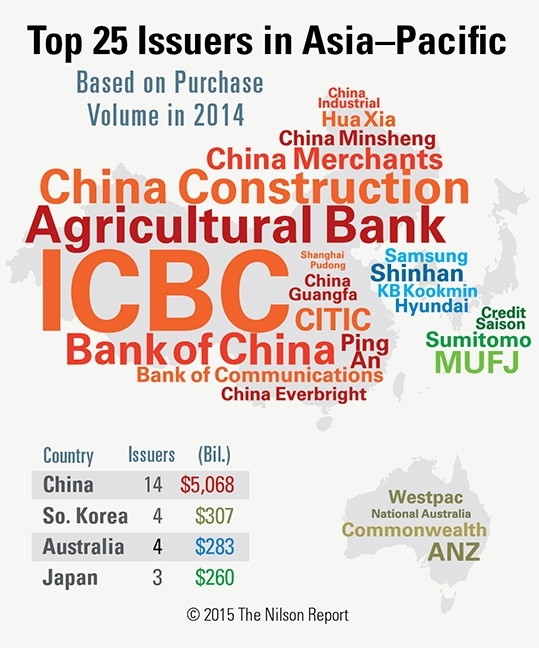 Among the 25 largest payment card issuers in the Asia-Pacific region in 2014, 14 were from China, 4 were from South Korea, 4 were from Australia, and 3 were from Japan. 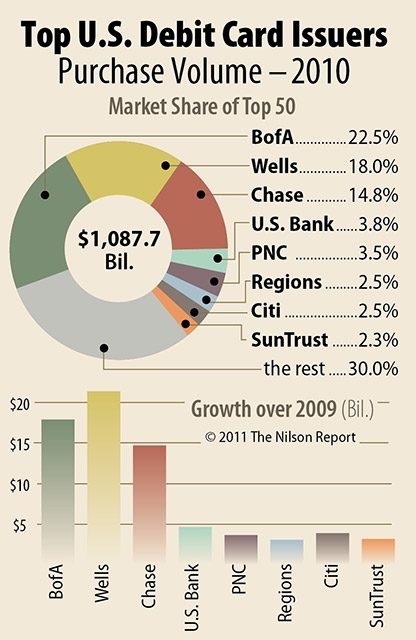 Combined, their purchase volume totaled $5.918 trillion dollars. 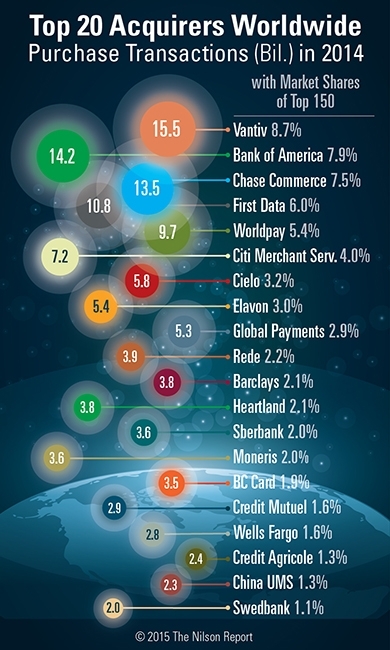 The 20 largest acquirers of payment card transactions at merchants worldwide are ranked based on the number of credit, debit, and prepaid card purchases handled in 2014. 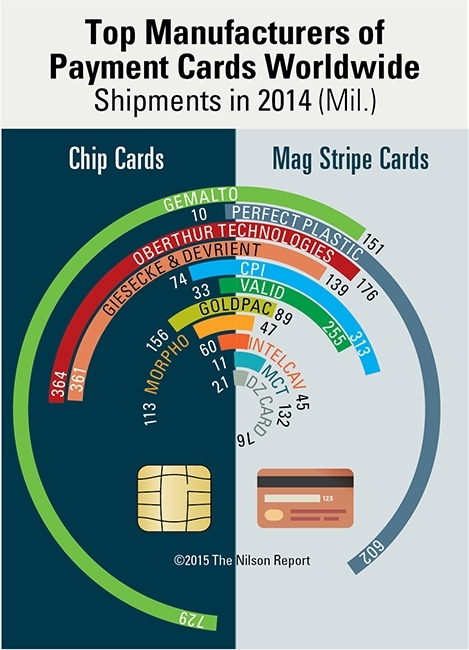 Manufacturers shipped 5.76 billion chip and magnetic stripe payment cards in 2014. 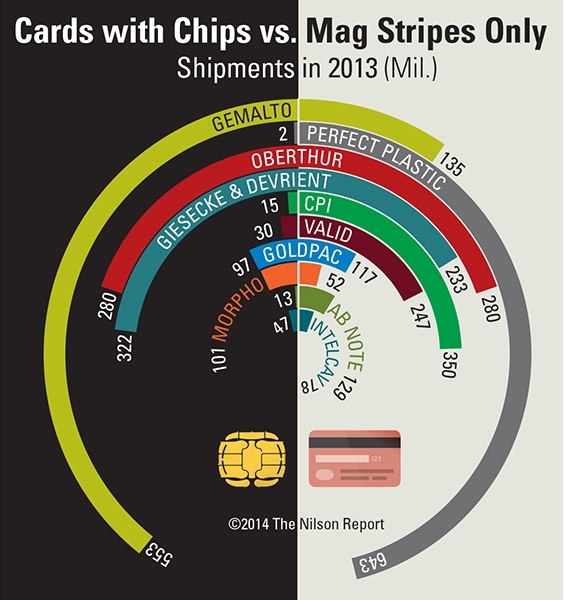 Mag-stripe-only cards accounted for 54.7% of all payment cards shipped. 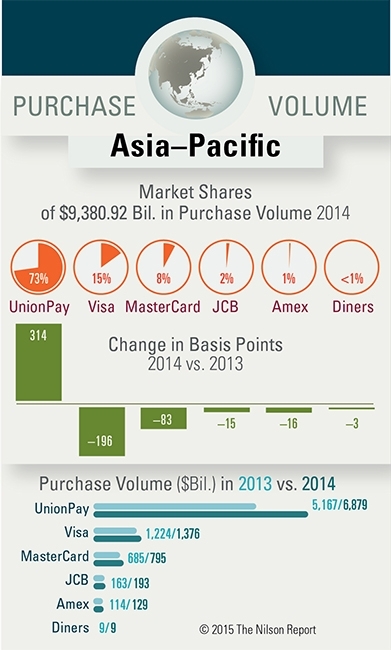 Visa, MasterCard, American Express, Diners Club, UnionPay, and JCB purchase volume (spending for goods and services) reached $9,380.92 billion in 2014. 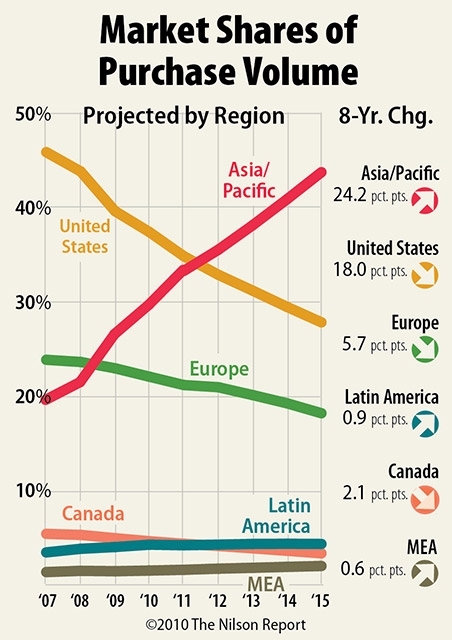 Market share figures are shown. 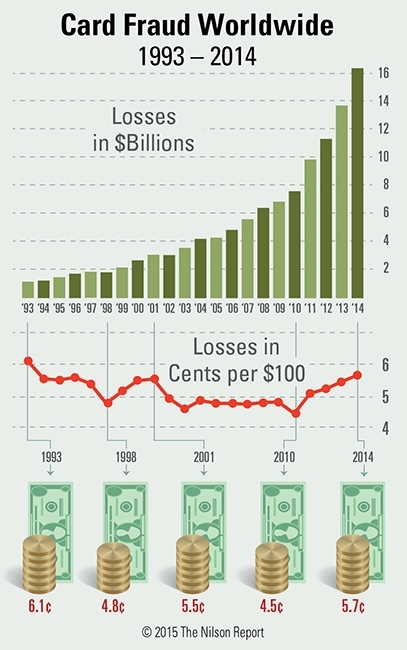 Losses incurred by card issuers, merchants, and acquirers reached $16.31 billion in 2014, up 19%. 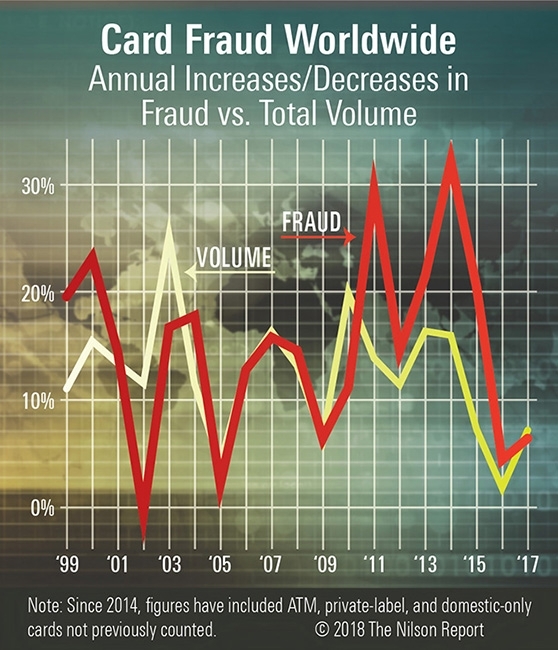 For the fourth year in a row, losses to fraud outpaced growth in total card volume. 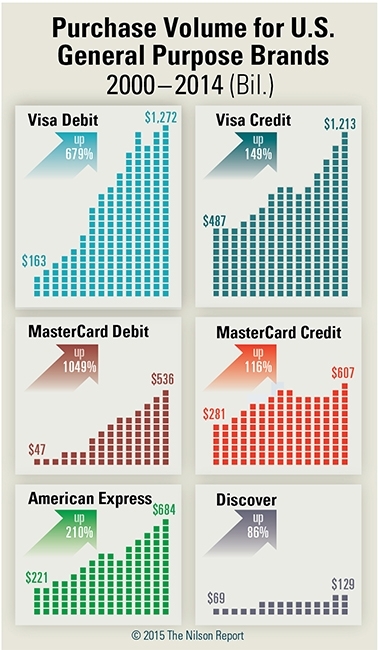 Credit Card Debt in the U.S. 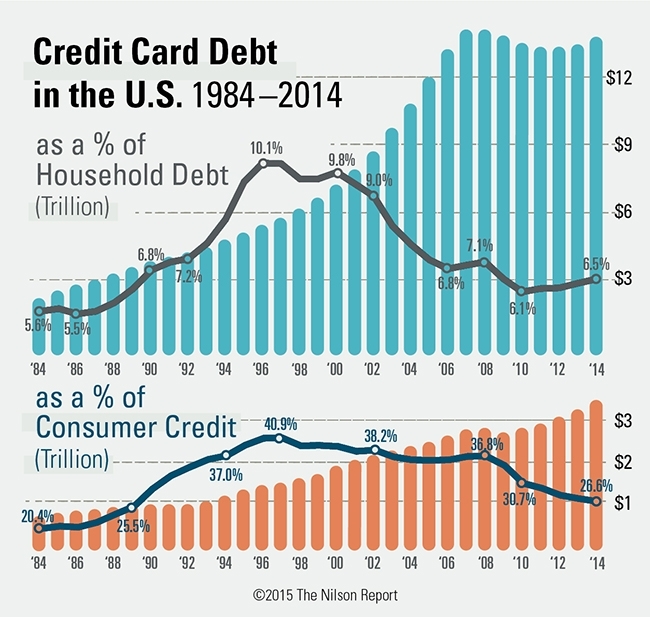 Combined outstanding debt on all types of credit cards in the U.S. of $881.57 bil. 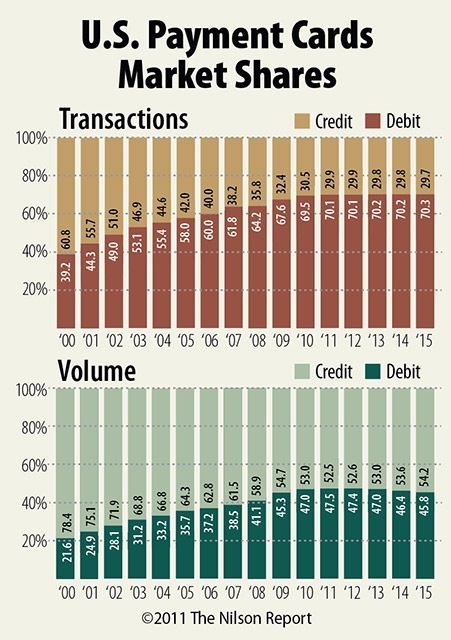 at year-end 2014 was the lowest level as a percent of total consumer credit since 1990. American Express, Discover/Diners Club, JCB, MasterCard, UnionPay, and Visa credit, debit, and prepaid card purchases at merchants are projected through 2019. The 5 top Visa and 5 top MasterCard U.S. debit/prepaid issuers are ranked based on combined signature and prepaid purchase volume. 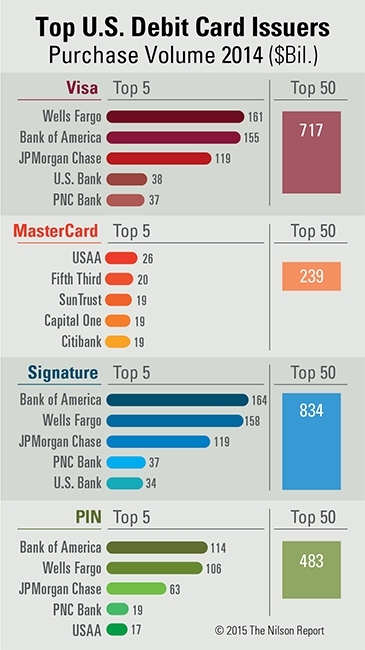 The top 5 Signature issuers and top 5 PIN issuers are also ranked. Purchases of goods and services at merchants in calendar year 2014 are measured. 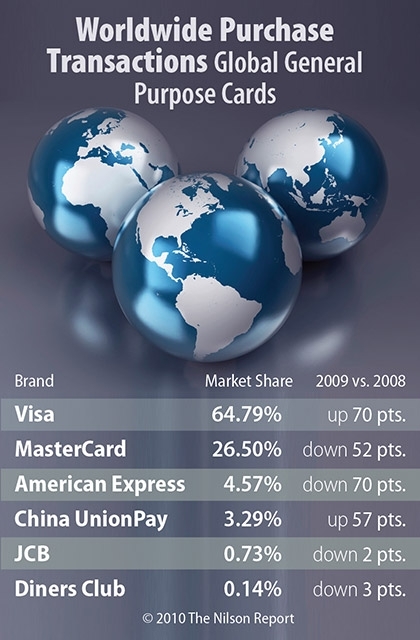 Market shares for the six global card networks are shown. 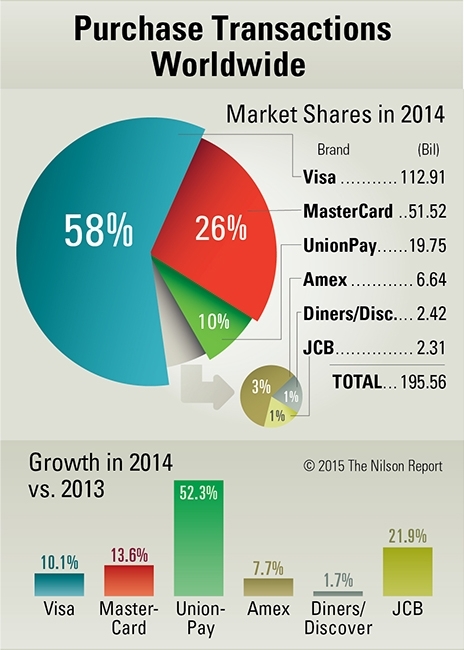 U.S. region cards carrying Visa, MasterCard, American Express, and Discover brands generated $4.442 trillion in spending at merchants in 2014, up 8.9% over 2013. 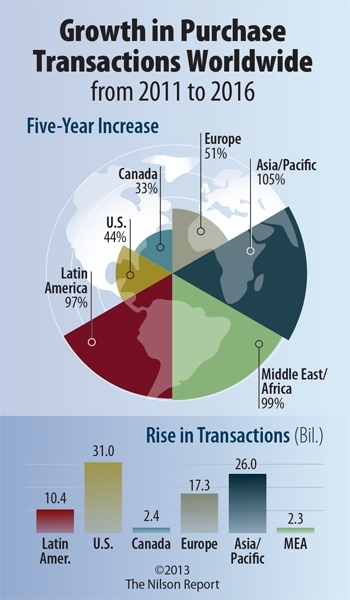 U.S., Canada, Latin America, Europe, Middle East-Africa, and Asia-Pacific card transactions are shown for calendar year 2013 and projected through calendar year 2023. The 77.9% of Personal Consumption Expenditures (PCE) in the U.S. for 2013 constitute Consumer Payment Systems (CPS), which include paper-based, card-based, and electronic-based payments. 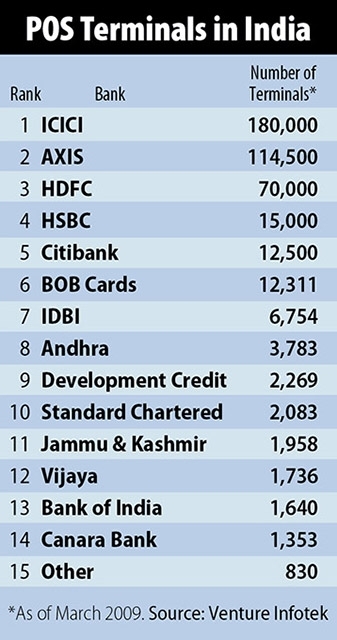 The 20 largest issuers of credit cards in the world ranked by outstanding receivables at year-end 2013 are shown. 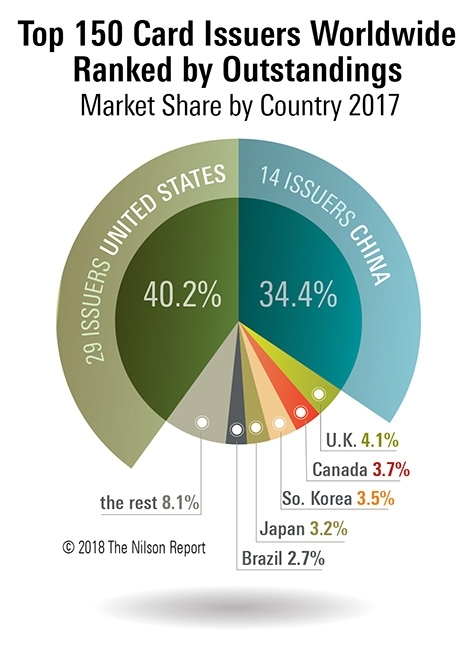 Issuers represent the U.S., China, U.K., Brazil, and Japan. 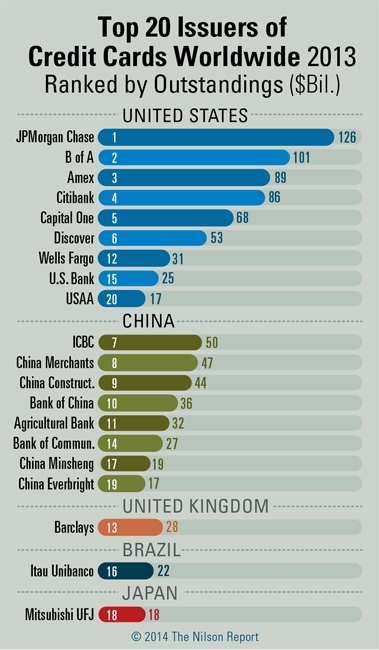 Eight banks from China dominate the list of Asia-Pacific’s largest payment card issuers. Rankings on pages 10 & 11 identify the 50 largest, which represent 12 countries. 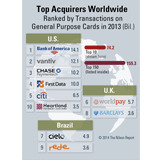 The chart on page 11 ranks the 150 largest acquirers of card transactions generated at merchants worldwide for 2013. 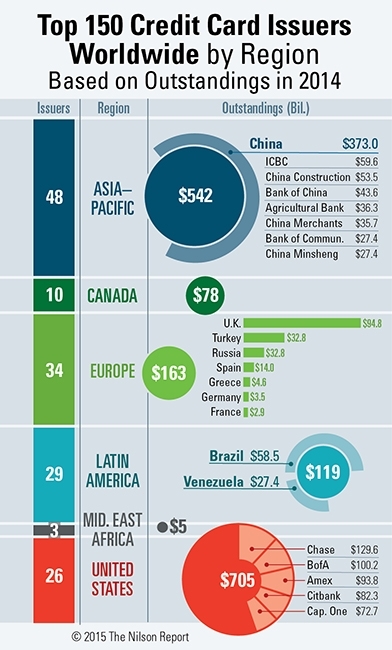 These acquirers represent 41 countries. The largest U.S. commercial card issuers are ranked on pages 9, 10, and 11 based on purchase volume totals and on the type of product — corporate, small business credit and debit, purchasing, fleet, and prepaid. 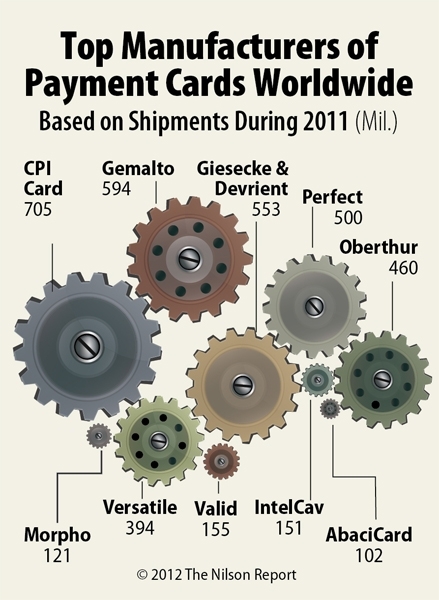 The 10 largest payment card manufacturers worldwide are shown with shipments in 2013 divided between cards carrying microchips and those carrying only magnetic stripes. 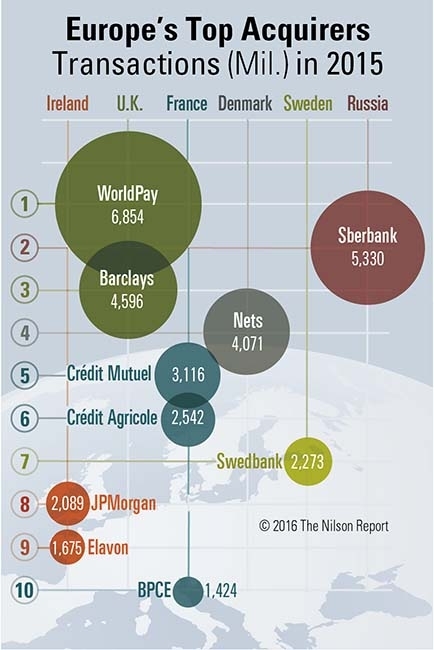 The 10 largest acquirers in Europe are ranked by the number of international brand and domestic-only brand credit and debit card payments they handled in 2013. 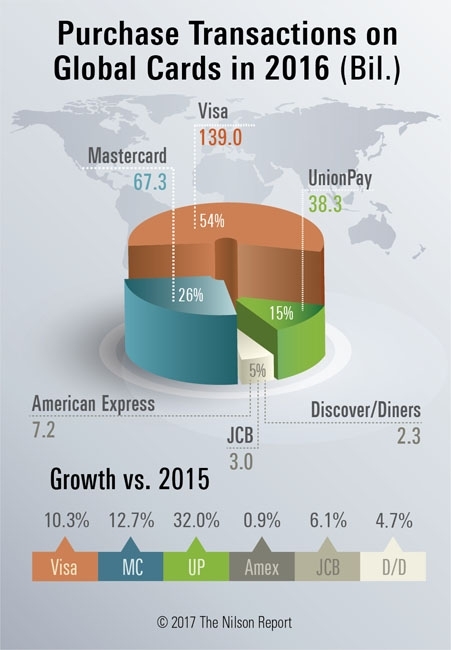 Visa, MasterCard, UnionPay, American Express, Diners Club, and JCB card transactions are identified by product for 2013 and projected through 2018. 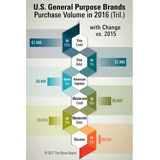 General purpose debit card issuers in the U.S. ranked 1 to 50 based on the dollar volume of purchases at merchants are listed on pages 10 and 11. 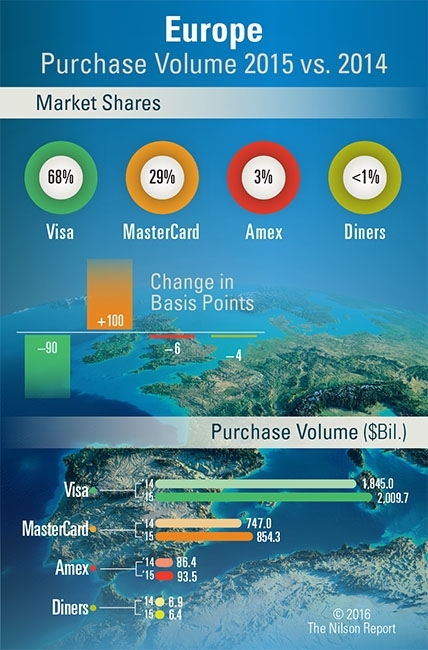 Visa, UnionPay, MasterCard, JCB, Diners Club, and American Express payment card transactions at merchants in 2013 are shown for credit and debit products. 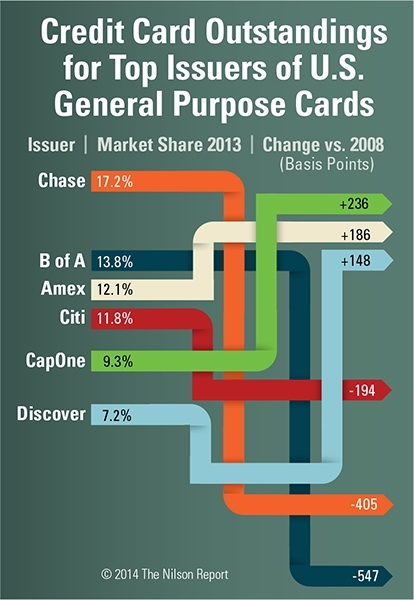 The six largest issuers of general purpose-type credit card products in the U.S. are ranked by outstanding receivables tied to their cards. 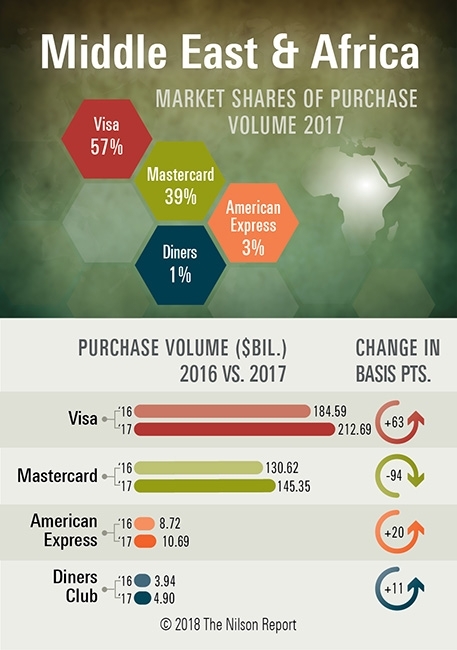 Visa, MasterCard, UnionPay, American Express, Maestro, JCB, Discover, and other general-purpose card transactions worldwide are projected through 2018. 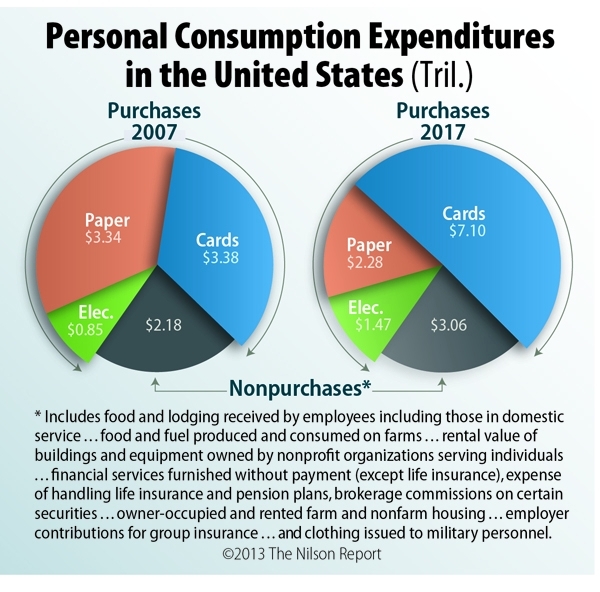 Personal Consumption Expenditures in the U.S.
Paper-based, card-based, electronic, and other payment systems in the U.S. are measured based on purchases for personal consumption expenditures. 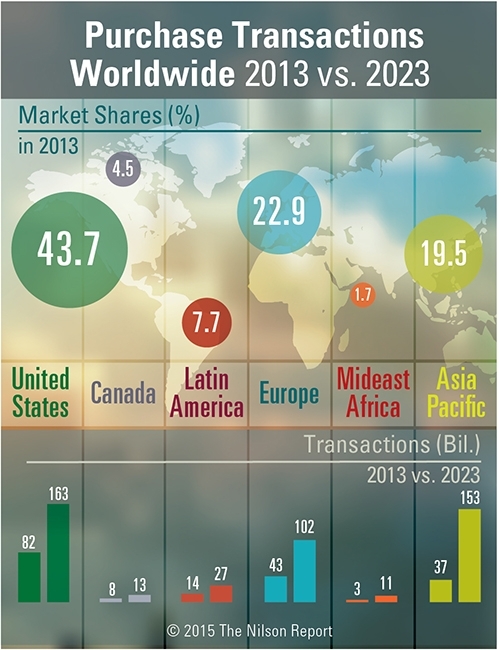 Total payment cards in circulation worldwide will exceed 20.56 billion by 2017. 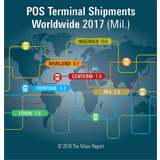 Manufacturers of point of sale terminals from all world regions are ranked by shipments of their devices in calendar year 2012. 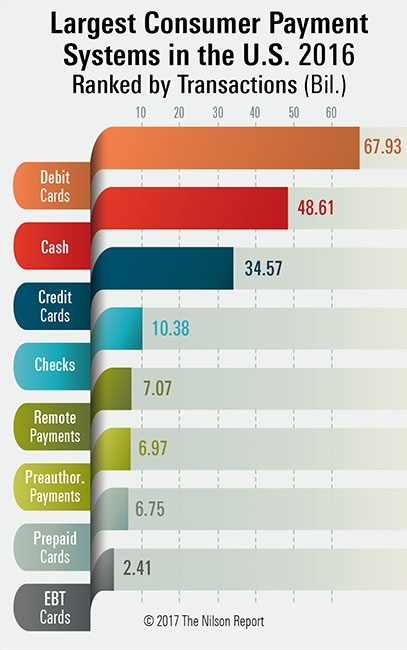 Total credit, debit, and prepaid card spending in 2012 is broken down for Visa, MasterCard, American Express, and Discover for both commercial and consumer products. Payment card issuers, merchants, and their acquiring banks lost $11.27 billion to fraud in calendar year 2012. 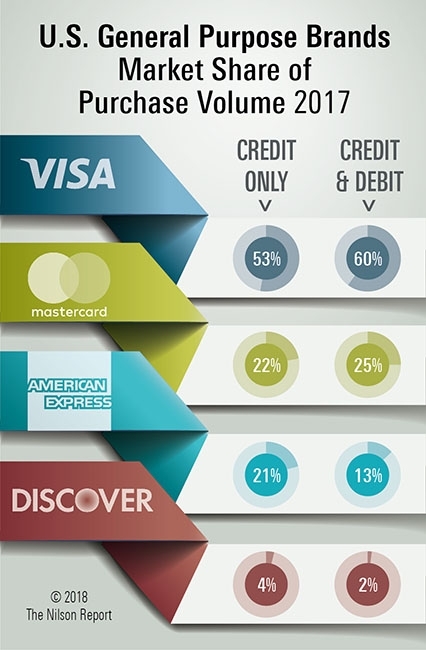 Visa and MasterCard issuers of credit and debit commercial card products are ranked by purchase volume generated by their portfolios in 2012. Store cards are owned either by retailers directly or by third-party specialists. Over the last 10 years, more retailers have chosen third parties to issue their cards. 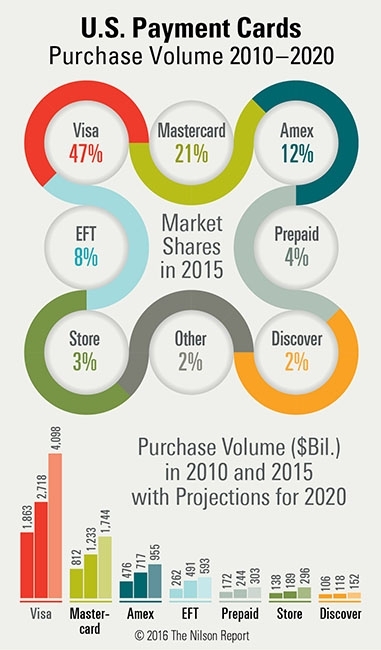 Visa, MasterCard, American Express, Discover, and PIN-based EFT network spending for calendar year 2012 is broken down between credit, debit, and prepaid products. 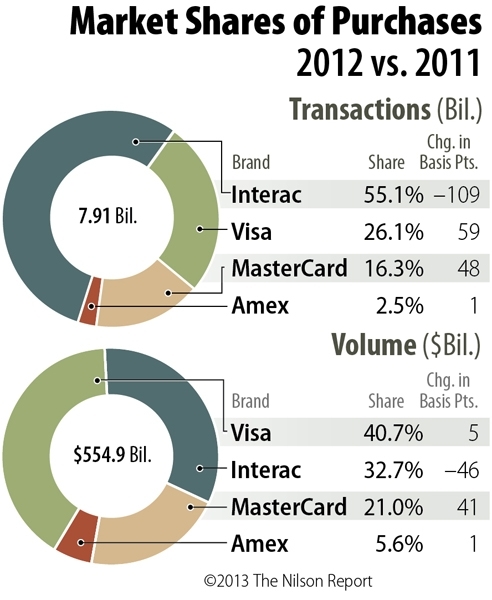 Interac, Visa, MasterCard, and American Express card brands are compared for purchase transactions and volume of spending at merchants. 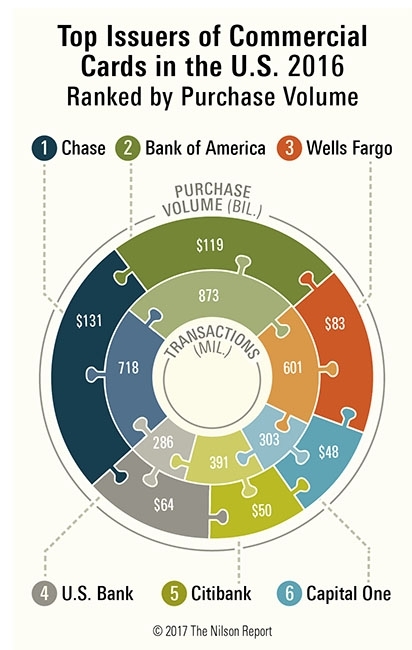 The 10 largest U.S. merchant acquirers ranked by general purpose transactions tied to PIN- and signature-based debit cards and credit cards accounted for 64.61 billion transactions. 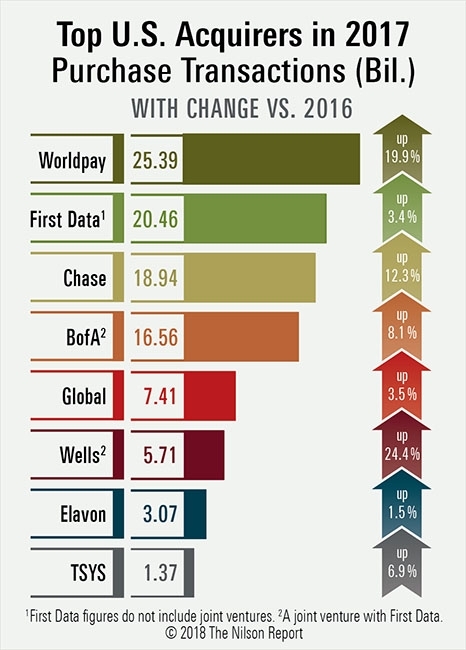 First Data, Bank of America, Vantiv, Elavon, Wells Fargo, Heartland, Global, WorldPay, TSYS, and Chase Paymentech. 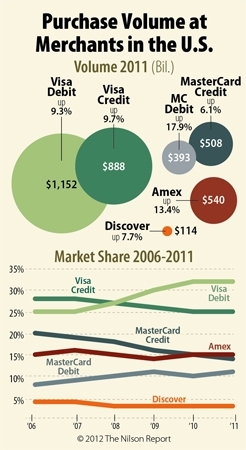 Market shares for American Express, Discover, MasterCard, and Visa credit and debit products for consumers and businesses are shown for the last 5 years. 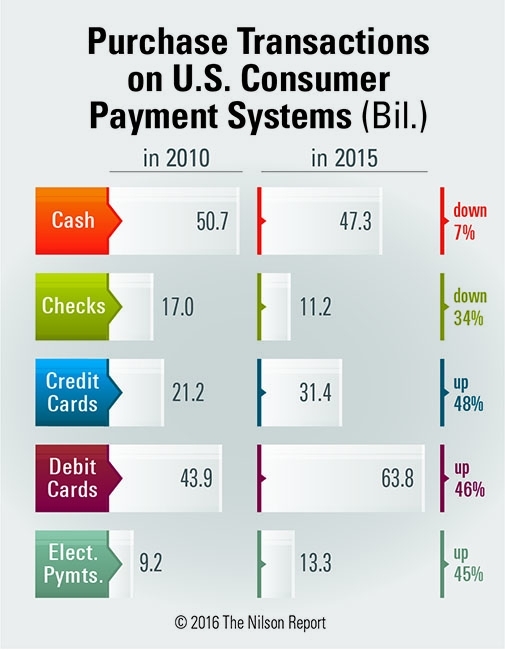 Consumer Payment Systems in the U.S. Personal consumption expenditures in the U.S. of $10.729 trillion in 2011 included purchases of goods and services, which accounted for 77.8%. 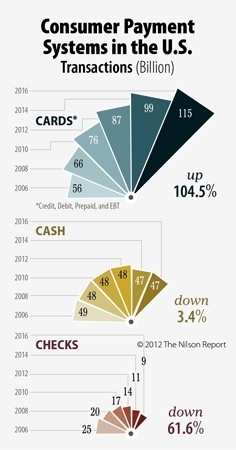 Cards in circulation numbered 8.91 billion in 2006. 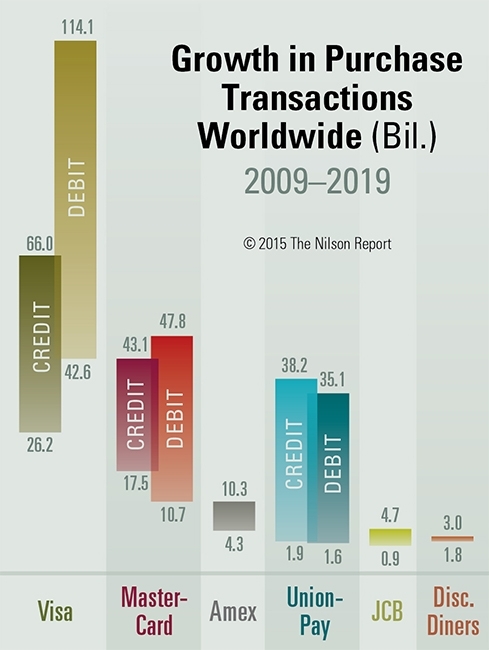 By 2011, there were 13.45 billion payment cards worldwide. That figure will reach 18.28 billion by 2016. 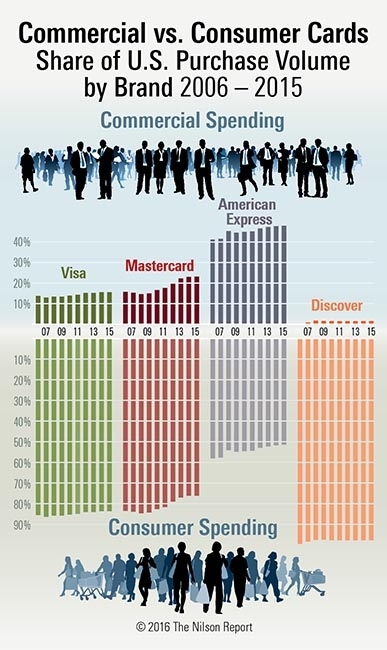 UnionPay, Visa, MasterCard, Maestro, American Express, JCB, Discover, and Diners. Producers of high-security-type payment cards manufactured in 2011 are ranked on pages 10, 11, and 12. Chip cards accounted for 28.9% of the total. 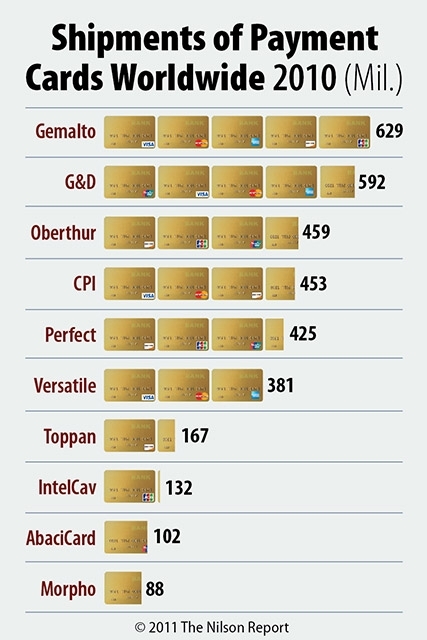 CPI Card, Gemalto, Giesecke & Devrient, Perfect, Oberthur, Morpho, Versatile, Valid, IntelCav, and AbaciCard. The 52 largest manufacturers of payment card authorization terminals are ranked on pages 8 and 9. 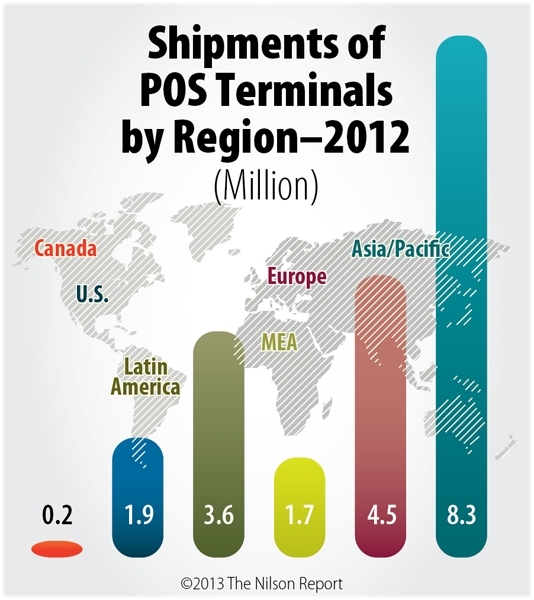 Shipments of 17.2 million terminals worldwide increased 14.4% in 2011. Total spending at merchants exceeded $187 billion and increased more than 24% over the prior year. 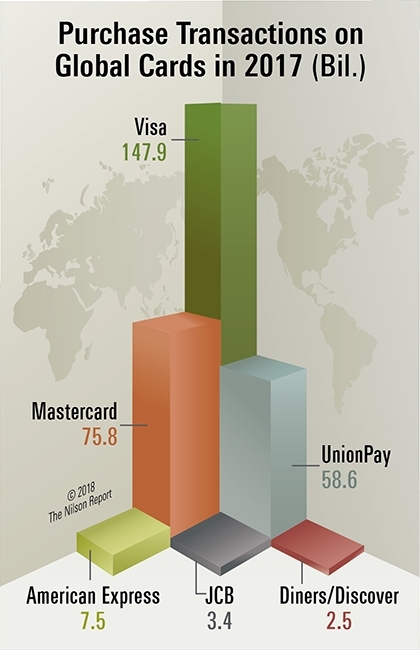 The region's 144 million payment cards generated 2.36 billion transactions. 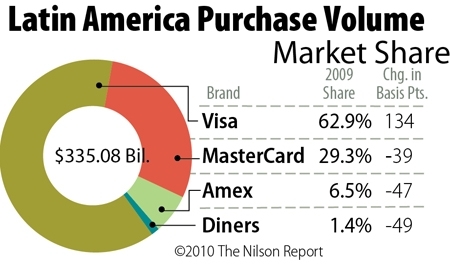 Visa, MasterCard, American Express, and Diners Club. More than 60 issuers of Visa and MasterCard commercial credit and debit cards are listed on page 9. Products include purchasing, T&E, fleet, and prepaid (payroll, benefits, incentives, etc.). Chase, Bank of America, U.S. Bank, Wells Fargo, Citigroup, Capital One, PNC, Comerica, Comdata, and BMO Harris. 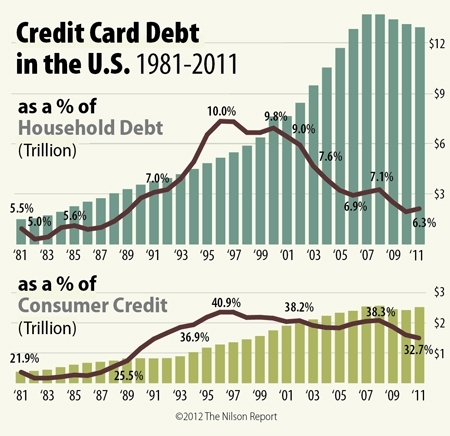 Credit card debt at the end of 2011 equaled 6.34% of total household debt. 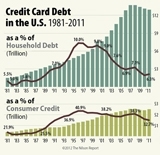 Card debt, as a percentage of total consumer credit, was at its lowest level since 1991. 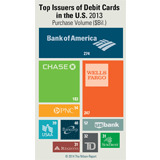 The 100 largest issuers of credit, debit, and prepaid cards are ranked on pages 10 and 11 based on spending at merchants. 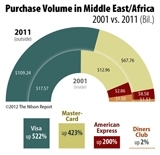 Credit cards equaled 53% of purchases at merchants in 2011. 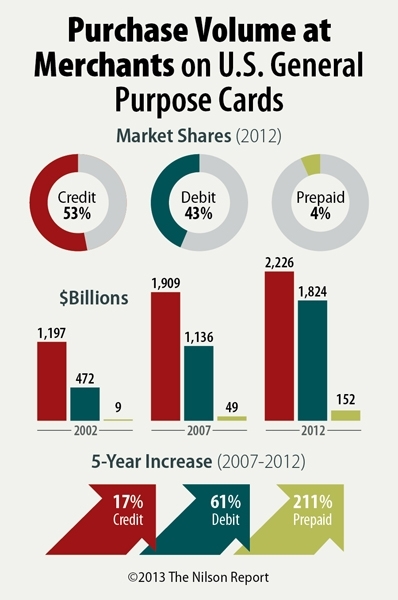 Debit and prepaid cards generated more than 54% of all payment card transactions at merchants in 2011. 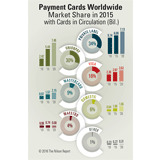 The total number of cards in circulation reached 6.54 billion at year-end. Brands include Visa, MasterCard, American Express, UnionPay, JCB, and Diners Club. 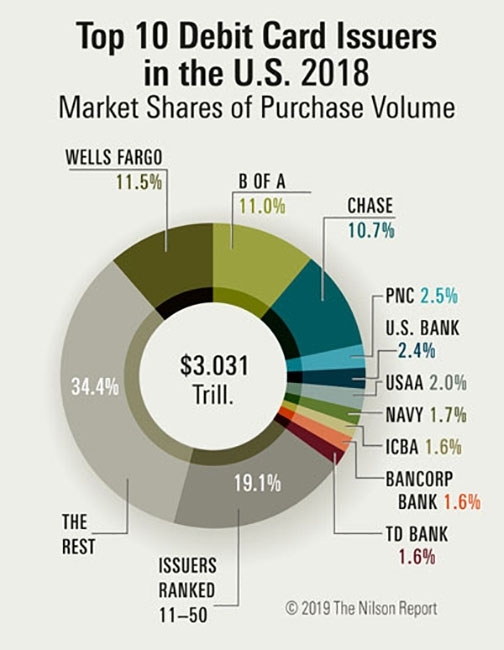 The 10 largest U.S. merchant acquirers handled $3.229 trillion in purchases in 2011 from more than 60 billion transactions generated by credit, debit, and prepaid cards. Companies include First Data, BAMS, Vantiv, Chase Paymentech, WorldPay, Heartland, Global Payments, Elavon, Wells Fargo, and TSYS. 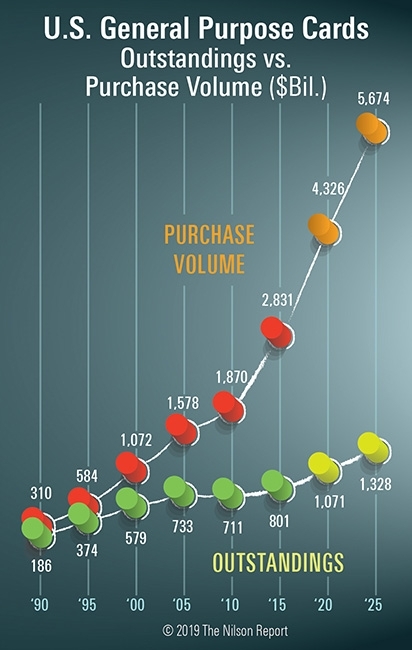 Purchase Volume at Merchants in the U.S. 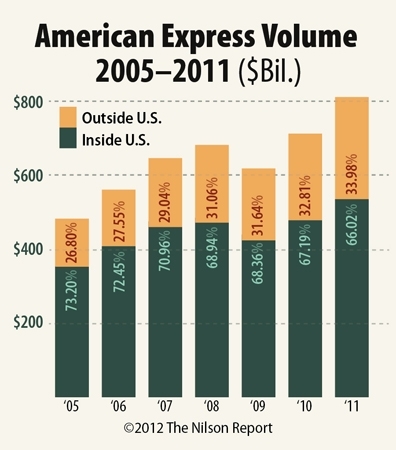 In 2011 American Express overtook MasterCard to gain second place among general purpose credit card brands in the U.S. based on spending at merchants. 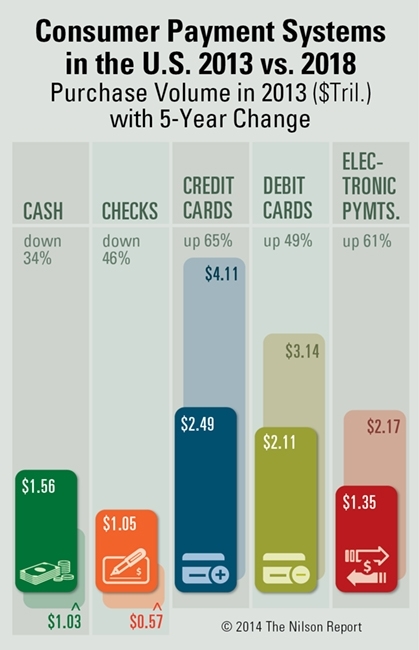 Total volume of purchases at merchants combined with cash advances generated by cards issued directly by American Express in the U.S. increased by 12.7% to $520.52 billion. 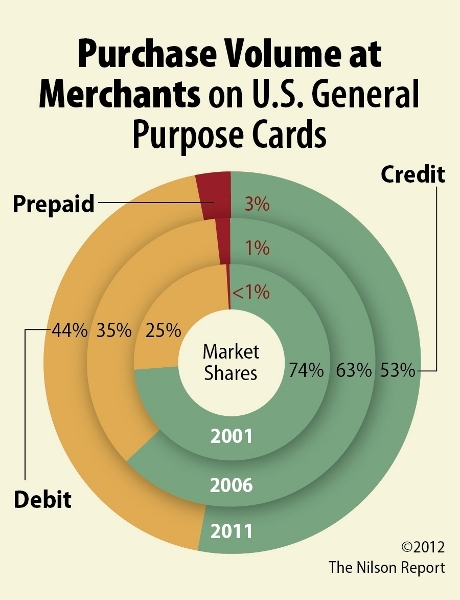 Spending at merchants for credit cards and debit cards is shown from 2000-2015. 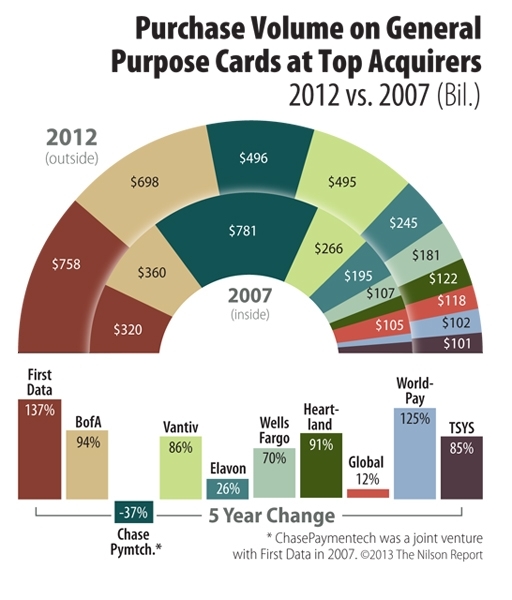 Also shown are outstandings, cards, transactions, and the number of cardholders. 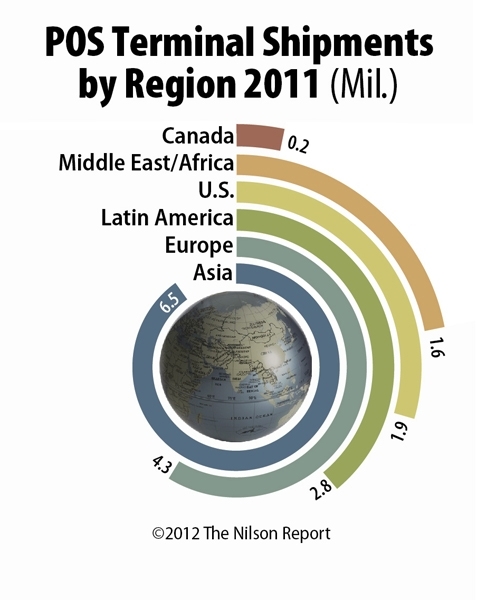 Figures reflect activity in Asia/Pacific, Canada, Europe, Latin America, Middle East/Africa, and in the United States. 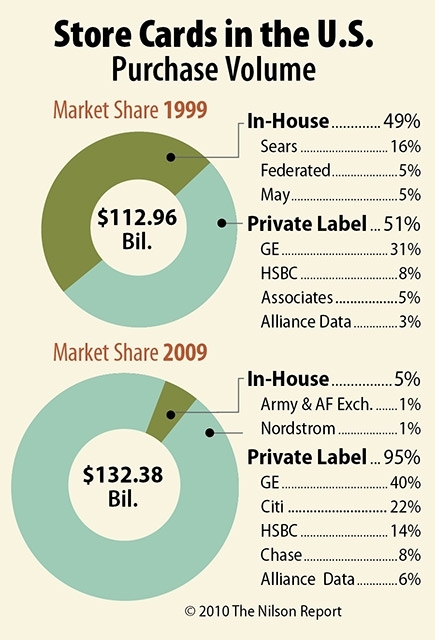 Market share is shown for 2005 and 2015. Figures are for high-security-type payment cards — those carrying the American Express, China UnionPay, Diners Club, Discover, JCB, MasterCard, and Visa brands. Manufacturers include Gemalto, Giesecke & Devrient, Oberthur, CPI, Perfect Plastic, Versatile Card Tech., Toppan, IntelCav, AbaciCard, and Morpho. 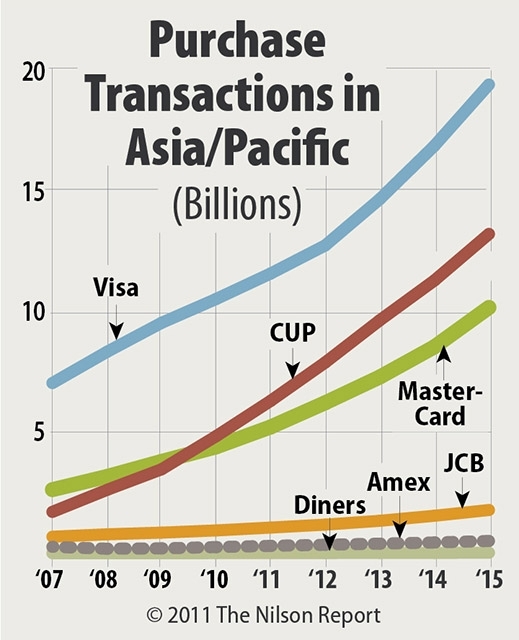 Figures are for Visa, China UnionPay, MasterCard, American Express, JCB, and Diners Club. Also included are total spending at merchants and cards issued for each brand. The 100 largest issuers are ranked by spending at merchants as well as by total spending including cash advances. 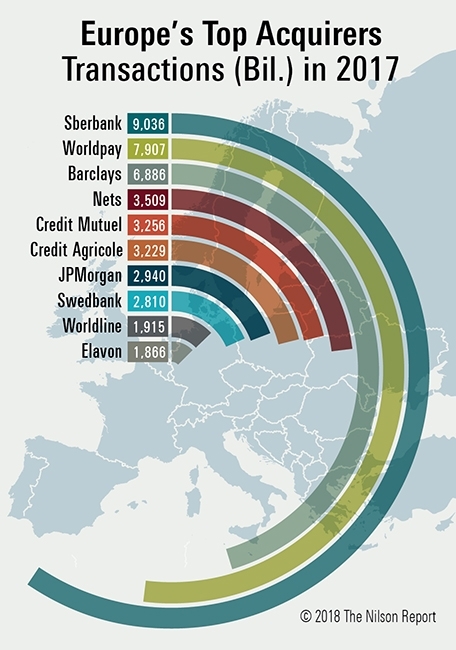 Figures include outstandings for the 10 largest issuers. Chase, Bank of America, Citibank, Capital One, Wells Fargo, U.S. Bank, HSBC, USAA, Barclays, and Target. 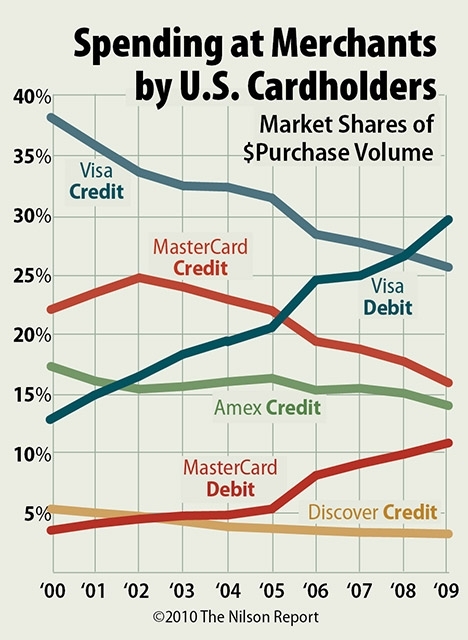 Visa brand cards held better than 60% of the market followed by MasterCard with a market share greater than 34%. American Express and Diners Club are also shown. The 50 largest U.S. commercial credit and debit card issuers are ranked by product — purchasing, fleet, corporate, small business credit, small business debit, and prepaid. 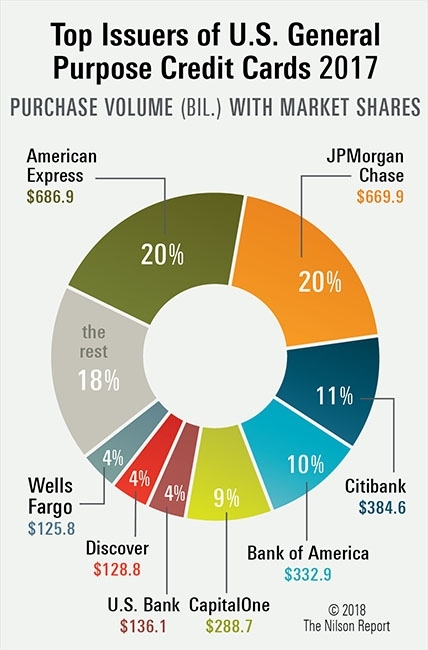 Issuers include Chase, Bank of America, U.S. Bank, Citibank, Wells Fargo, Capital One, Comerica, and PNC. American Express, Diners Club, MasterCard, and Visa credit, debit and prepaid cards totaling 524.1 million are presented. Figures include spending at merchants and transactions. 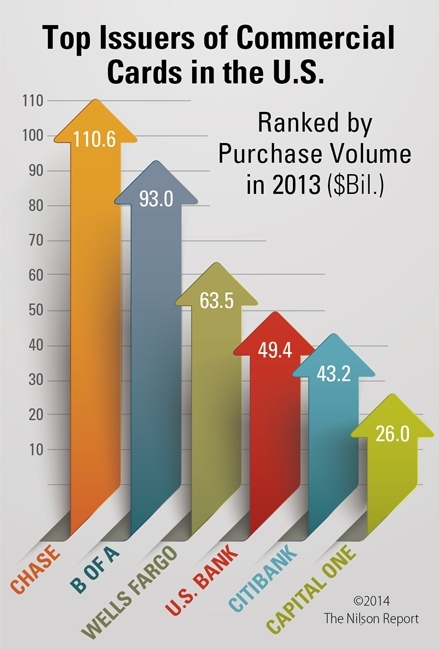 The 50 largest issuers of debit cards in the U.S. are ranked by spending at merchants. Figures show Signature and PIN separately. Also shown are the number of prepaid cards issued. 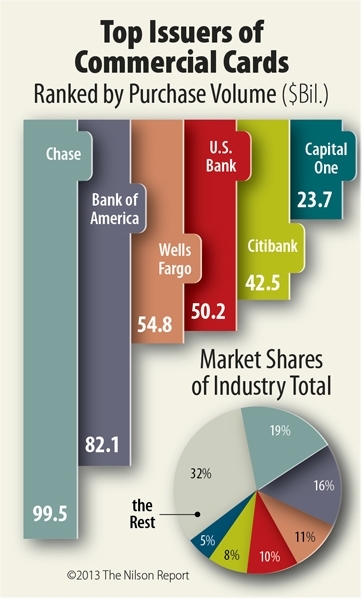 Issuers include Bank of America, Wells Fargo, Chase, U.S. Bank, PNC, Region, Citibank, and SunTrust. Figures include purchases at merchants and transactions for Visa, MasterCard, American Express, China UnionPay, JCB, and Diners Club. Credit, debit and prepaid are shown separately. 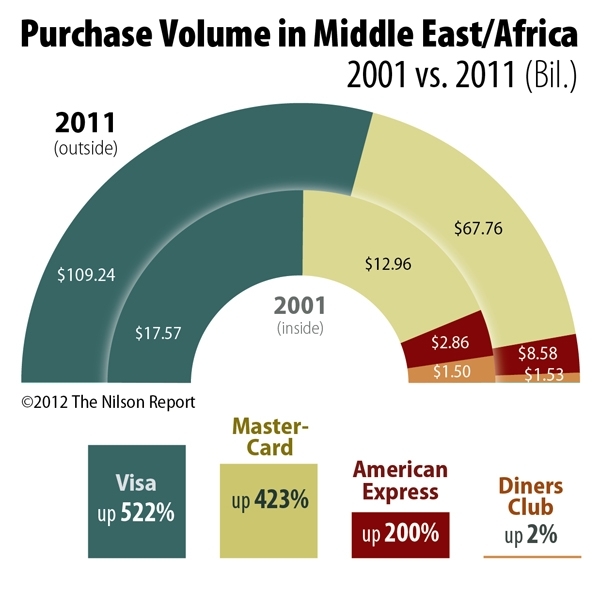 Visa and MasterCard credit and debit, American Express credit, and Discover credit card purchase volume at merchants for 2010. Includes market share by brand and product. 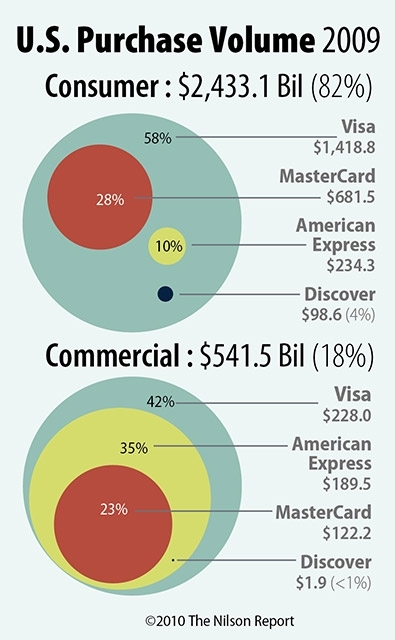 Chart shows credit card outstandings and spending at merchants tied to Discover cards issued in the U.S. 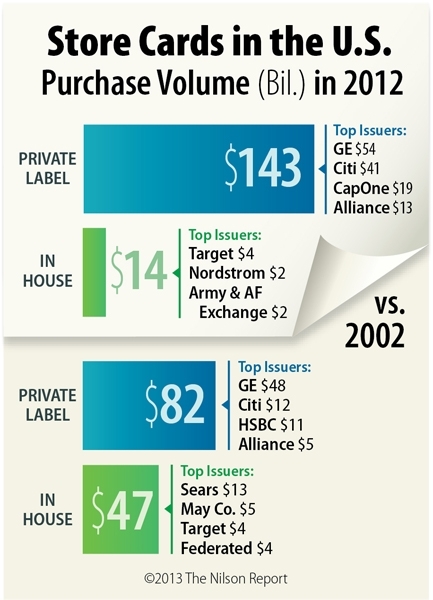 Figures cover 2000-2010 and include business tied to third-party issuers. 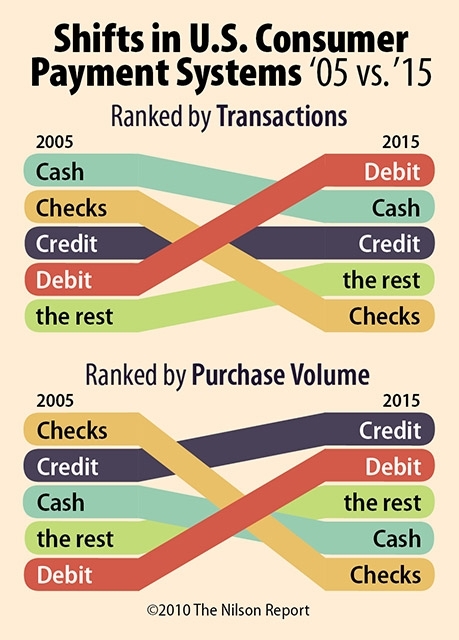 Cash, checks, credit cards, debit cards, and other payment instruments are ranked by transactions and purchase volume for the years 2005 and 2015. General purpose credit, debit, and prepaid cards branded with Visa, MasterCard, Amex, Discover, JCB, Diners, UnionPay, Interac, and other local systems are projected. Figures shown reflect Asia/Pacific, U.S., Europe, Latin America, Canada, and Middle East/Africa and include all general purpose brands. 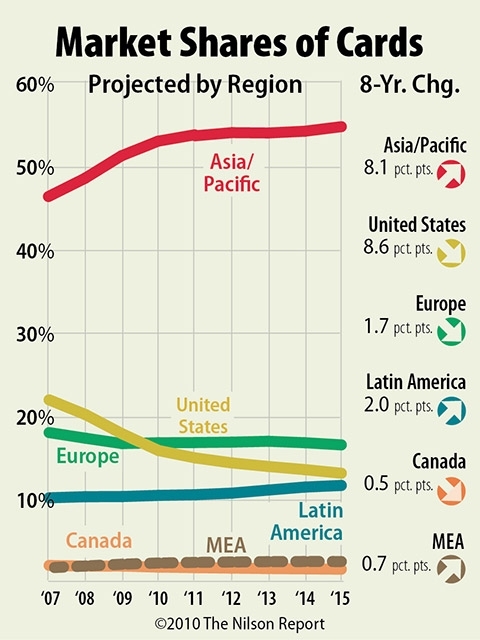 They are projected through 2015. Figures represent consumer card versus commercial card spending for goods and services. 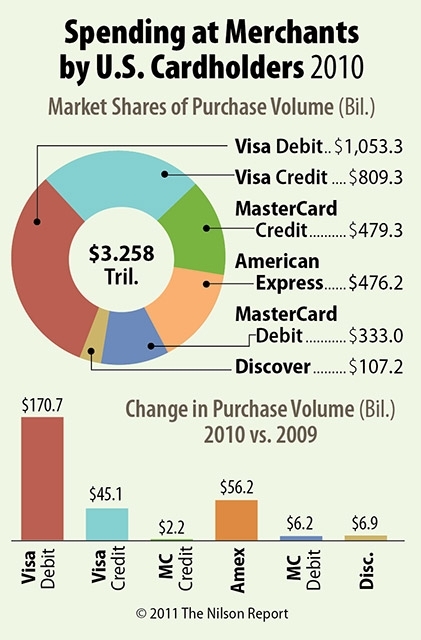 Consumer cards accounted for $2.433 trillion or 82% of the total. Brands include Visa, MasterCard, American Express, and Discover. 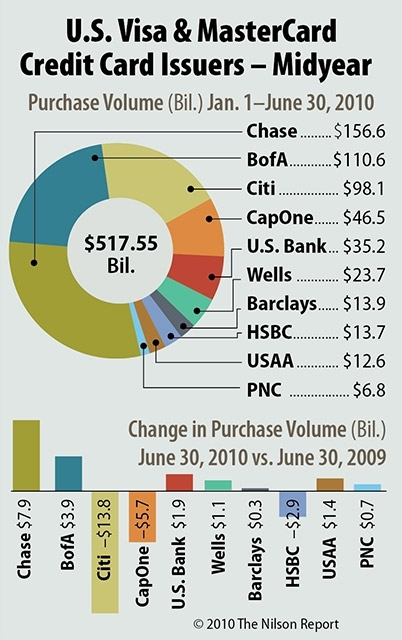 The 100 largest U.S. issuers of Visa and MasterCard credit cards based on outstanding debt at June 30 as well as total volume for the first six months of 2010 are shown. 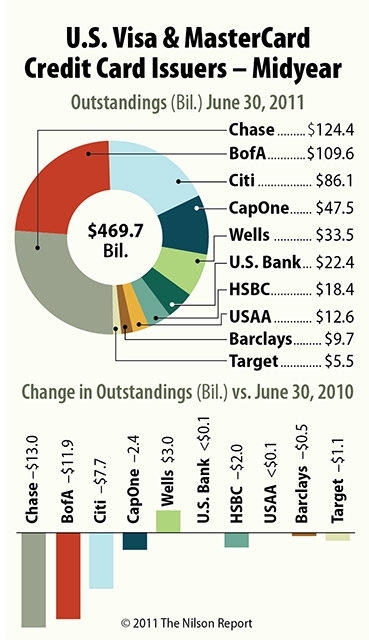 Issuers include Chase, Bank of America, Citibank, Capital One, U.S. Bank, Wells Fargo, Barclays, HSBC, USAA, and PNC. 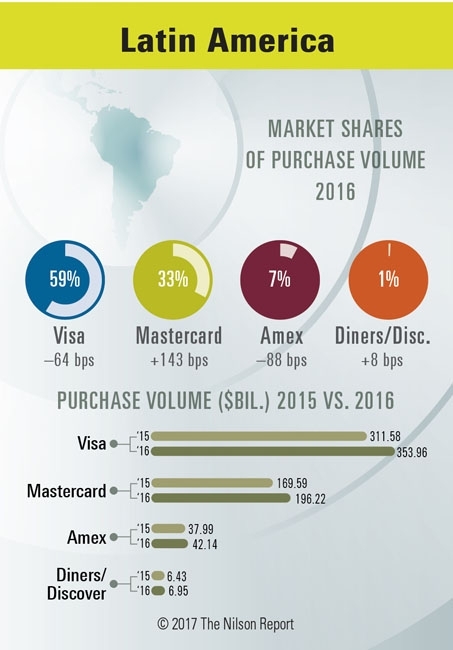 Visa, MasterCard, American Express, and Diners Club market shares are shown for $335.08 billion in Latin America and Caribbean region based on spending at merchants. 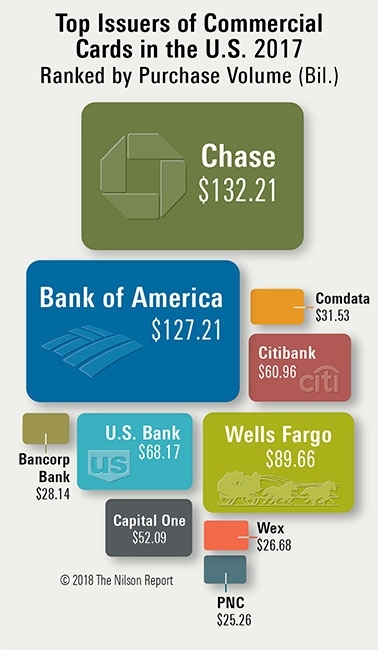 The largest U.S. issuers of small business debit and credit cards, purchasing, corporate, and fleet cards as well as prepaid cards are ranked based on spending at merchants. 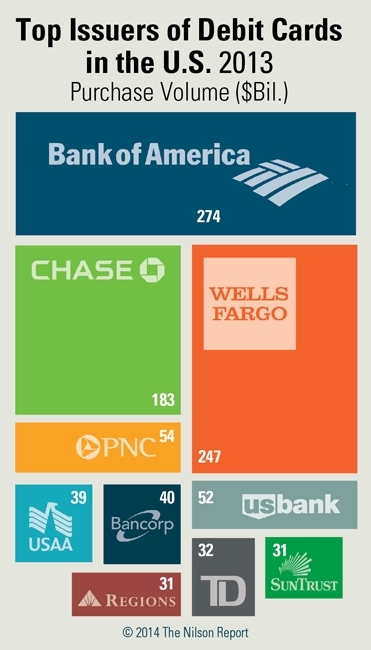 Issuers include Chase, Bank of America, U.S. Bank, Citibank, Wells Fargo, Capital One, Comerica, and PNC. Store Cards in the U.S. 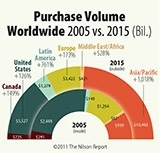 Figures show purchase volume for calendar years 2009 and 1999. Merchants who own and operate their own card portfolios are shown separately from private label card specialists. Issuers include Sears, Federated, May, GE, HSBC, Associates, Alliance Data, Army & Air Force Exchange, Nordstrom, Citibank, and Chase. 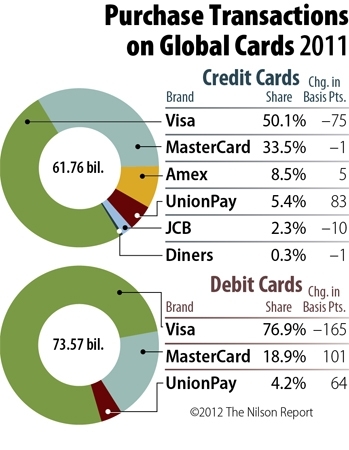 Market share figures for the global general purpose card brands are shown including Visa, MasterCard, American Express, China UnionPay, JCB, and Diners Club. 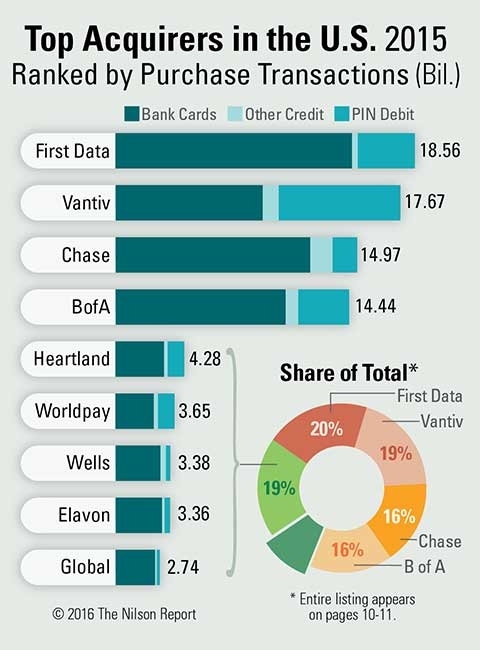 The 10 largest U.S. merchant acquirers ranked by general purpose transactions tied to PIN- and signature-based debit cards and credit cards accounted for 50.50 billion transactions. 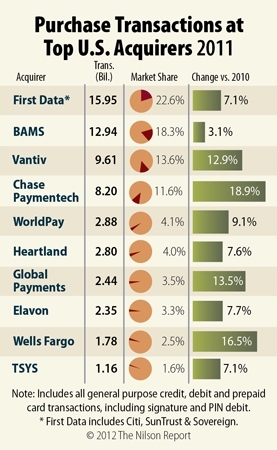 Acquirers include First Data, Banc of America (BAMS), Fifth Third, FNMS, Chase Paymentech, Heartland, Wells Fargo, Elavon, RBS WorldPay, and Global Payments. 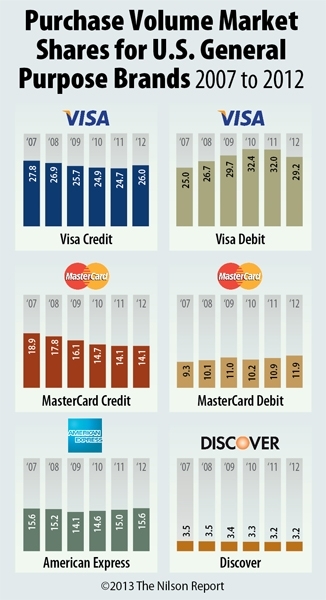 Figures show Visa credit, MasterCard credit, Visa debit, American Express credit, MasterCard debit, and Discover credit. Market shares are for purchase volume at merchants. The largest acquirers of merchant card transactions in India are listed by the number of POS terminals deployed. Nearly all outlets in India use a single POS terminal. Acquirers include ICICI, Axis, HDFC, HSBC, Citibank, BOB Cards, IDBI, Andhra, Development Credit, Standard Chartered, Jammu & Kashmir, Vijaya, Bank of India, and Canara Bank. Please check back - the first 2019 chart will be published in mid-January.